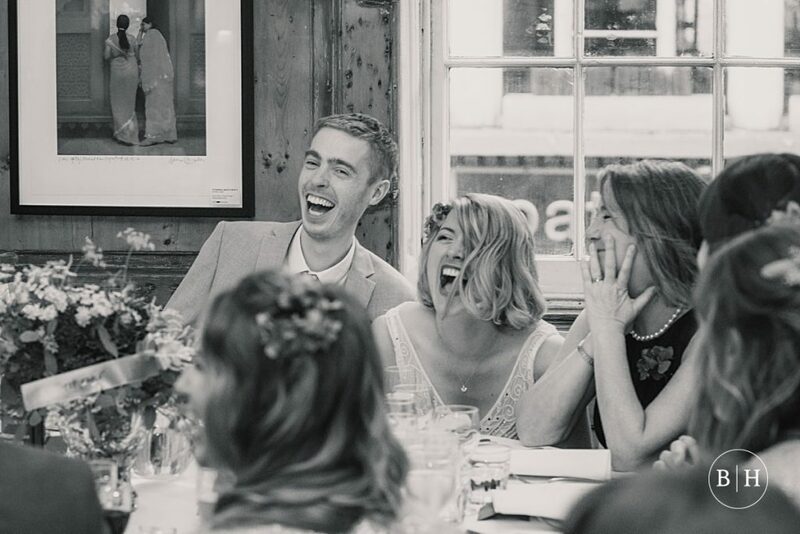 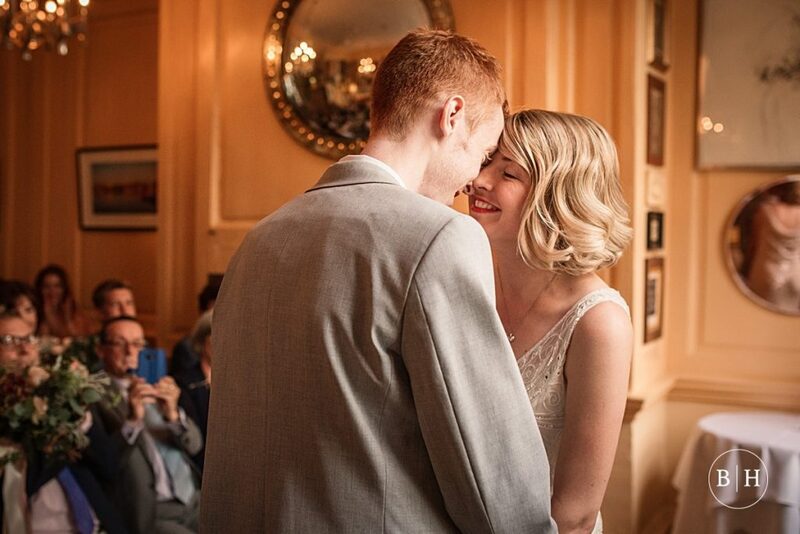 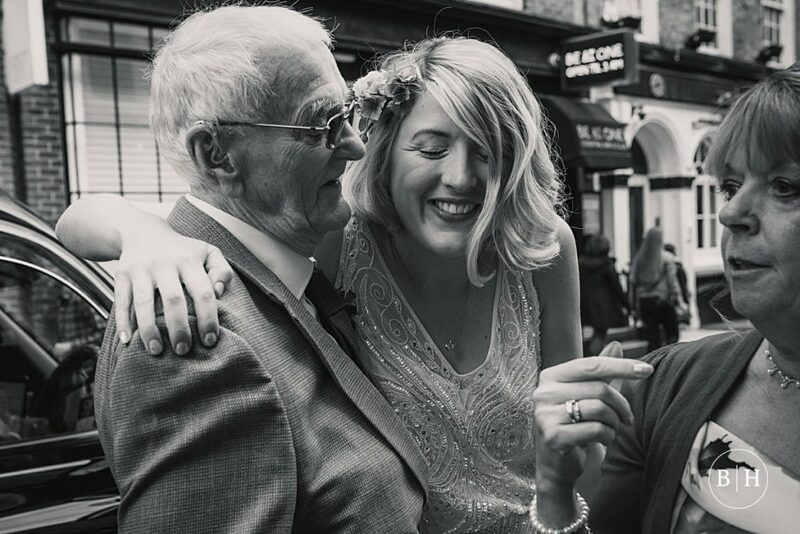 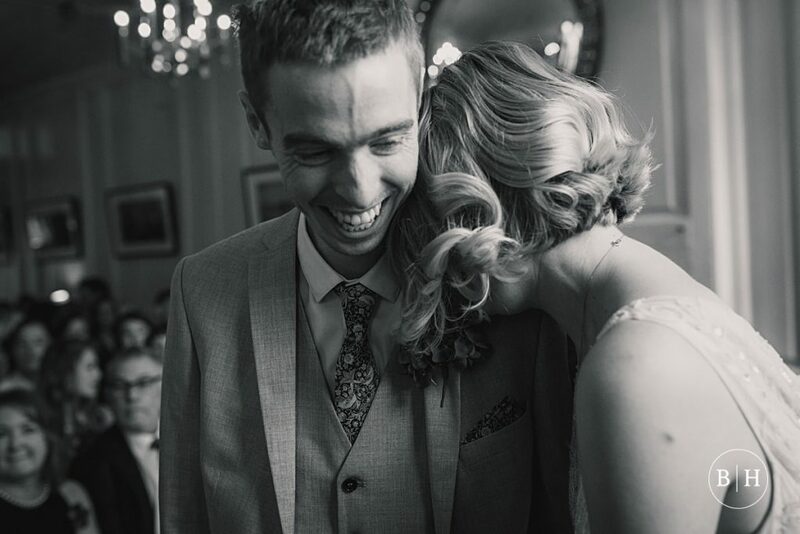 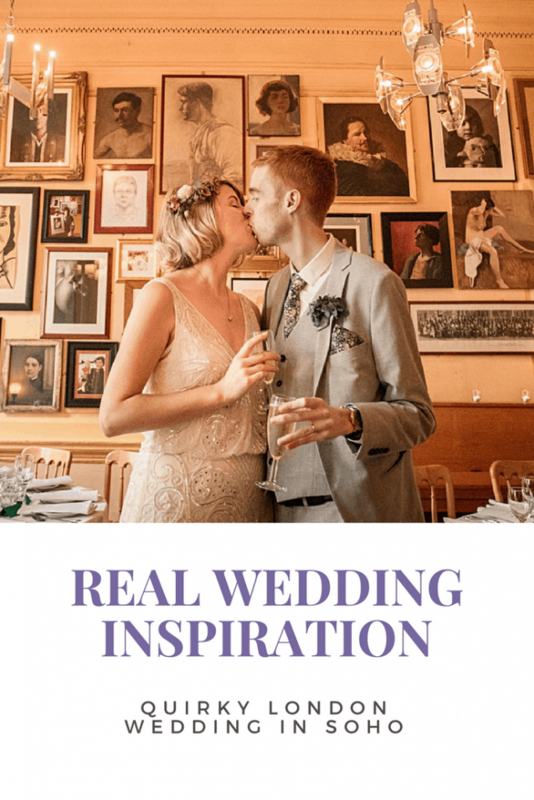 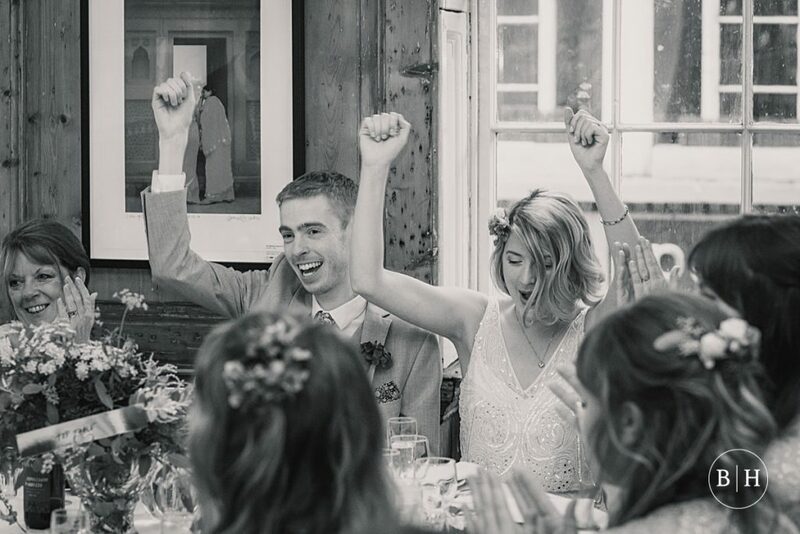 Chloe and Sam’s awesome London Soho Union Club wedding was a particular highlight of my wedding season! 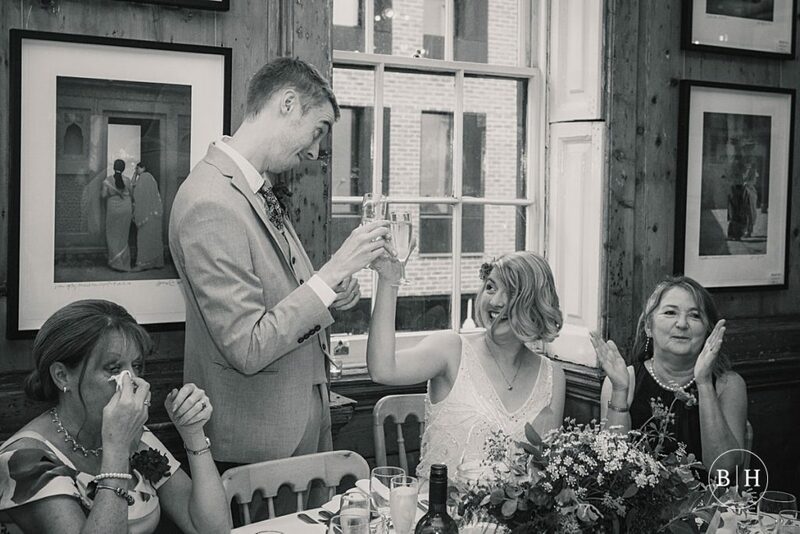 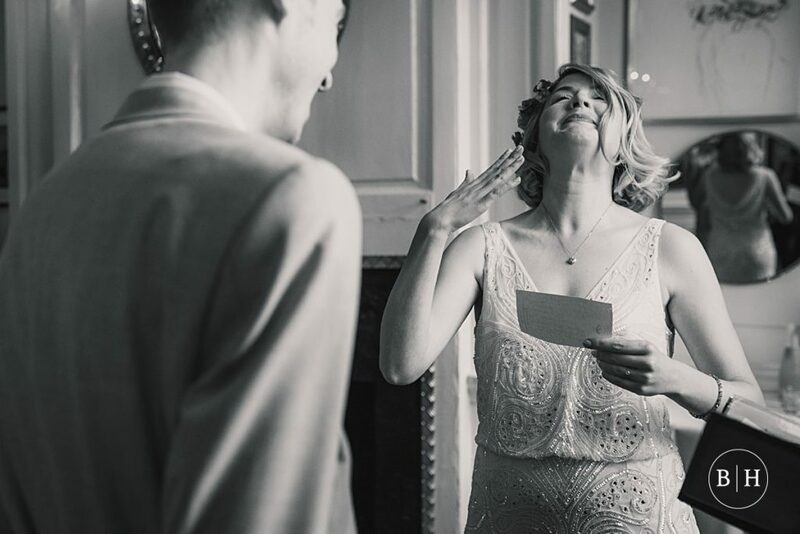 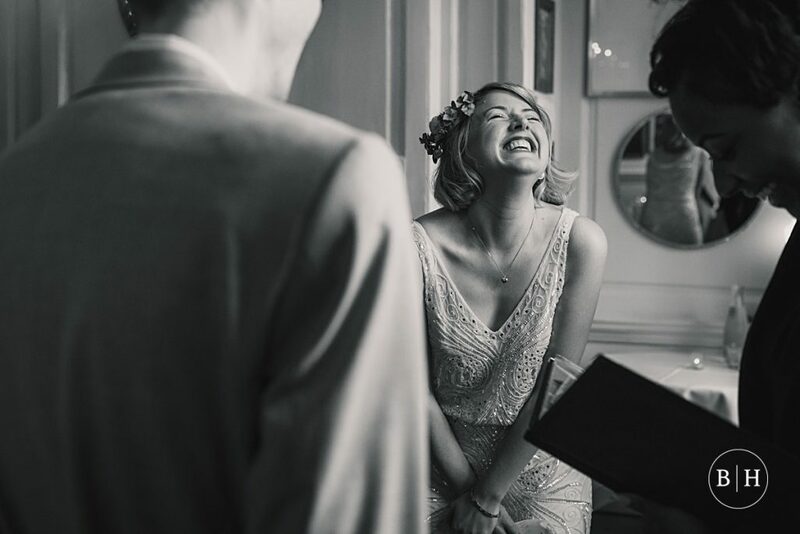 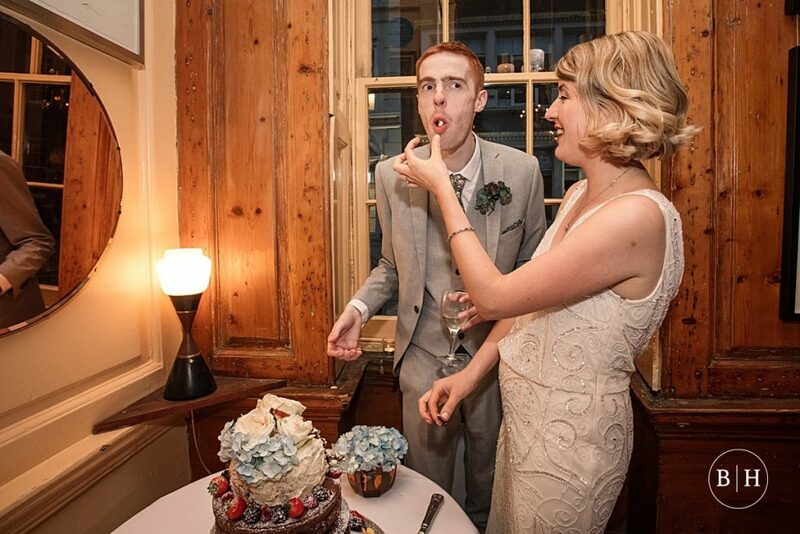 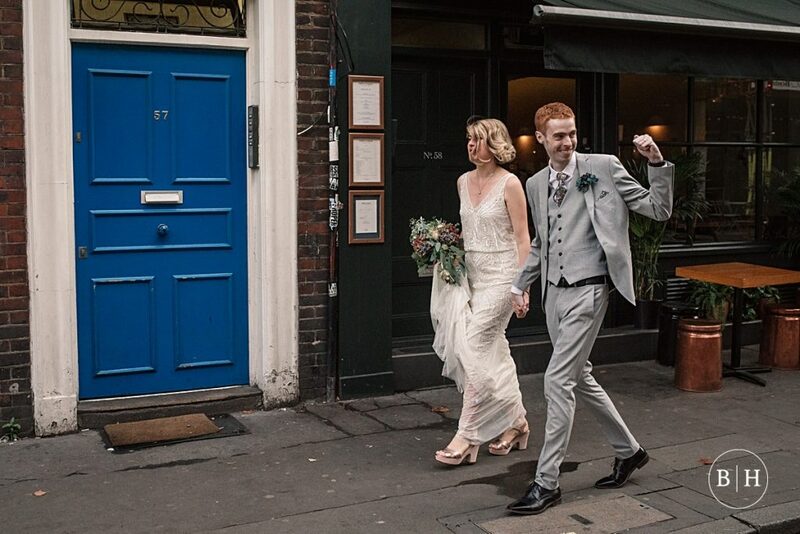 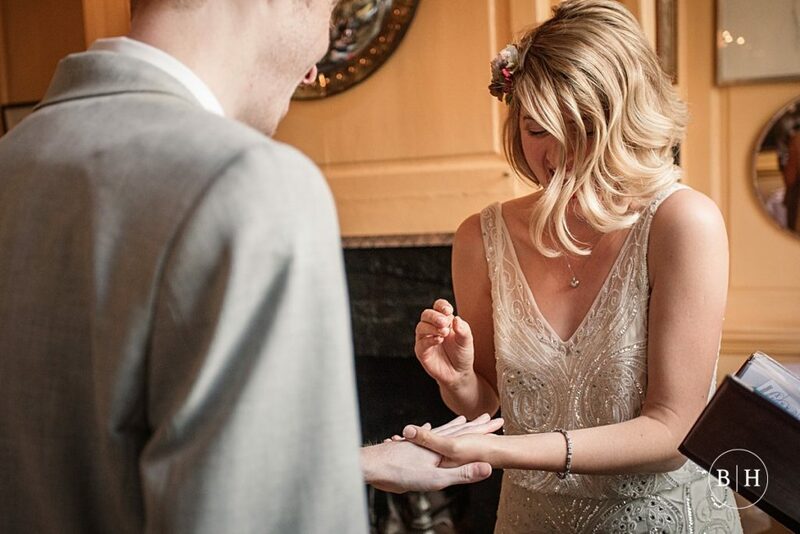 Chloe and Sam got married in September at the very quirky Soho Union Club, which is an old members only club in Soho. 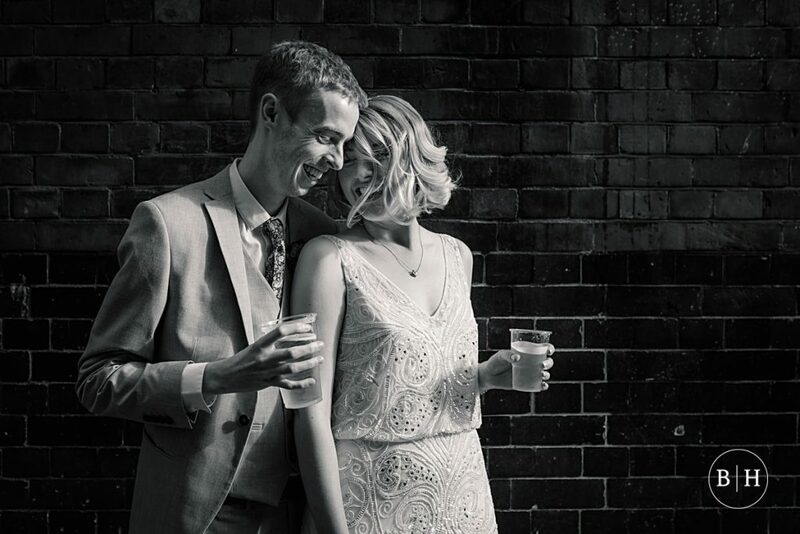 You might recognise them from their summer Engagement shoot that I blogged about recently. 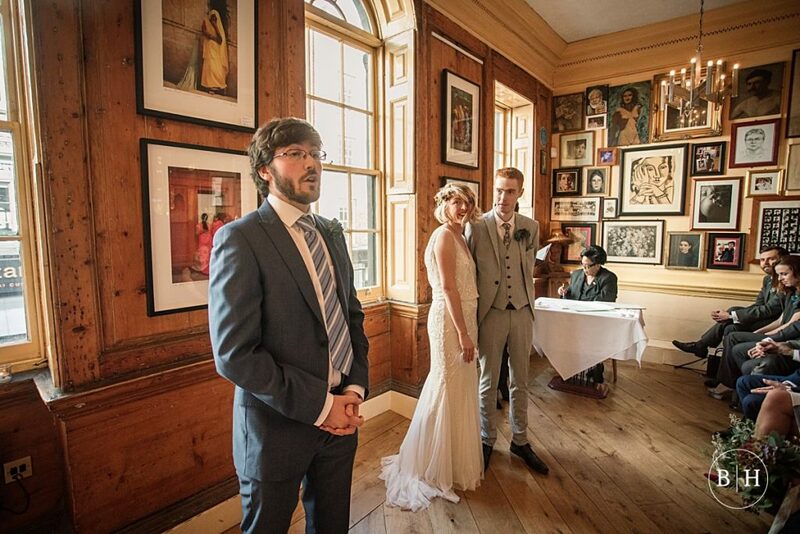 The couple had their ceremony there in the intimate dining room, and celebrated in the studio space in the evening. 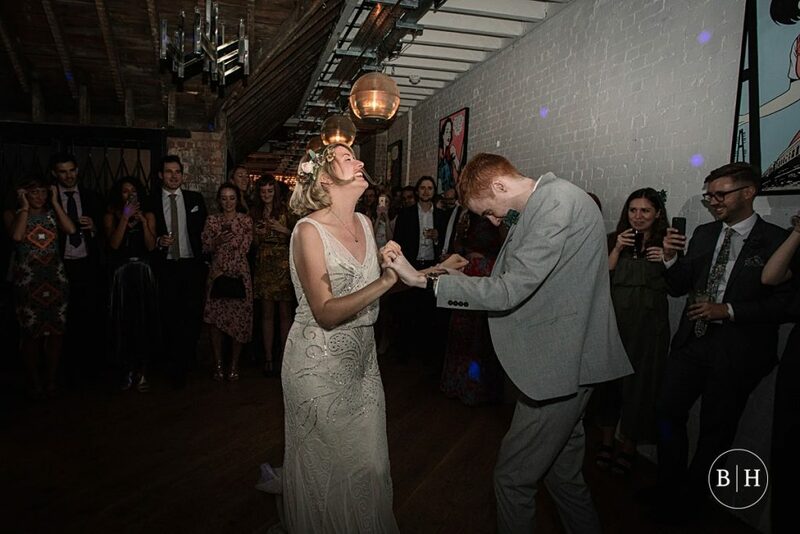 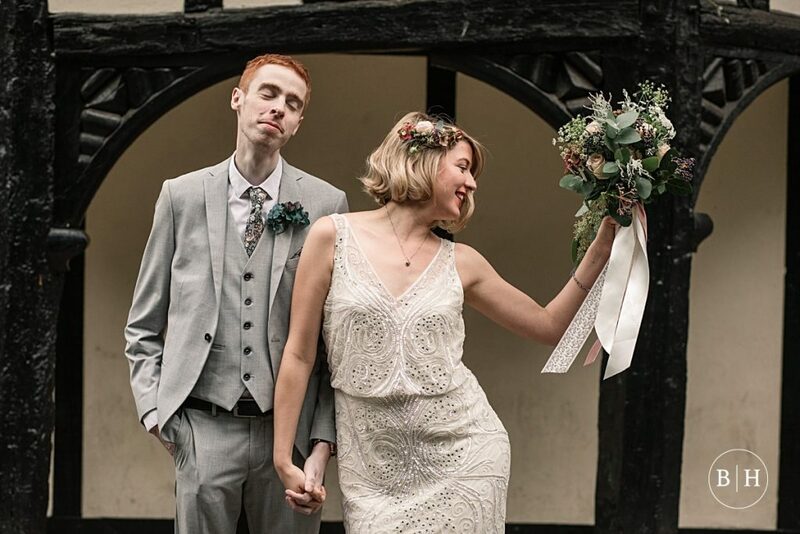 Chloe and Sam chose the Soho Union Club because they live in London, and met in Soho at Soho radio station just a short walk away, so it all tied in together so nicely. 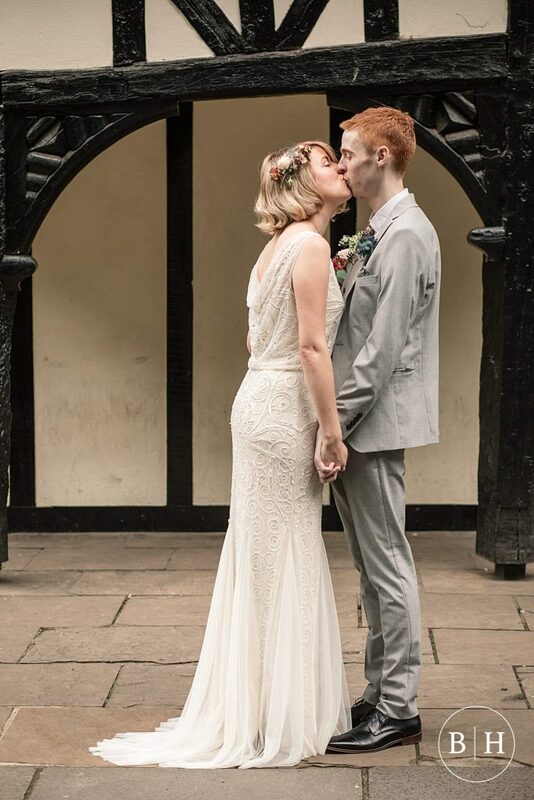 They looked at one venue and they just fell in love with it! 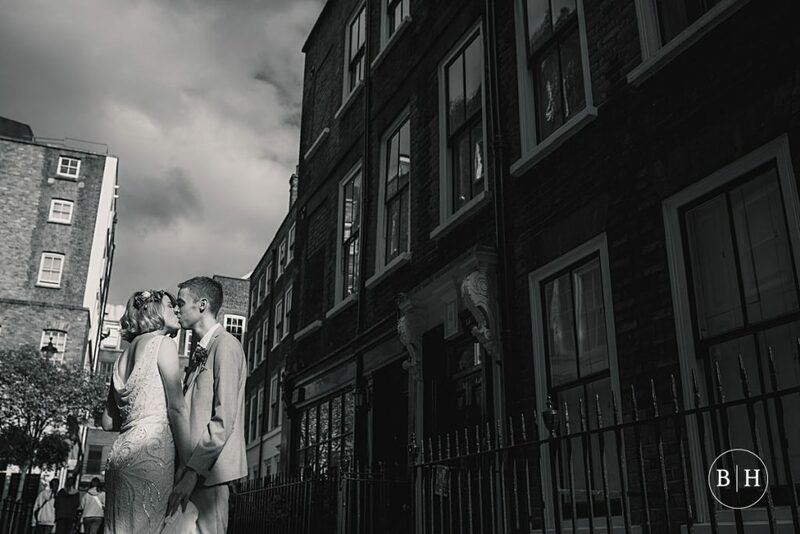 I love shooting London weddings because the surroundings offer endless possibilities for photos. 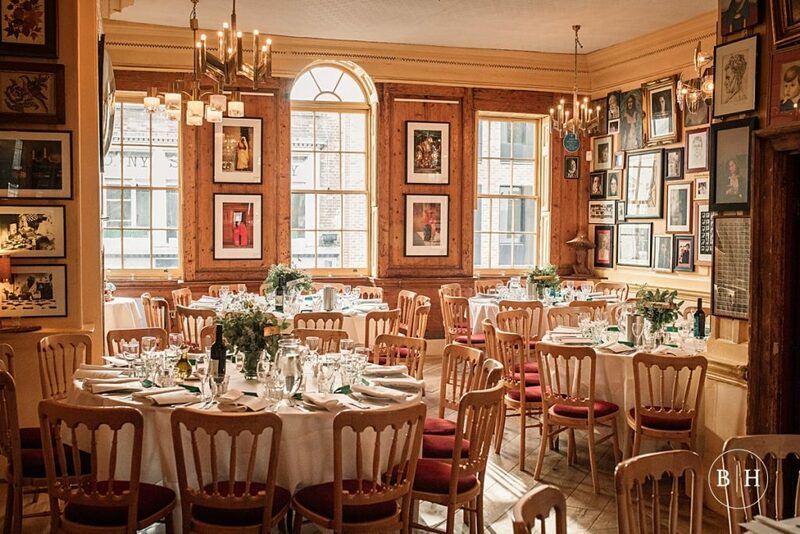 And I absolutely love the Soho Union Club and all it’s quirks! 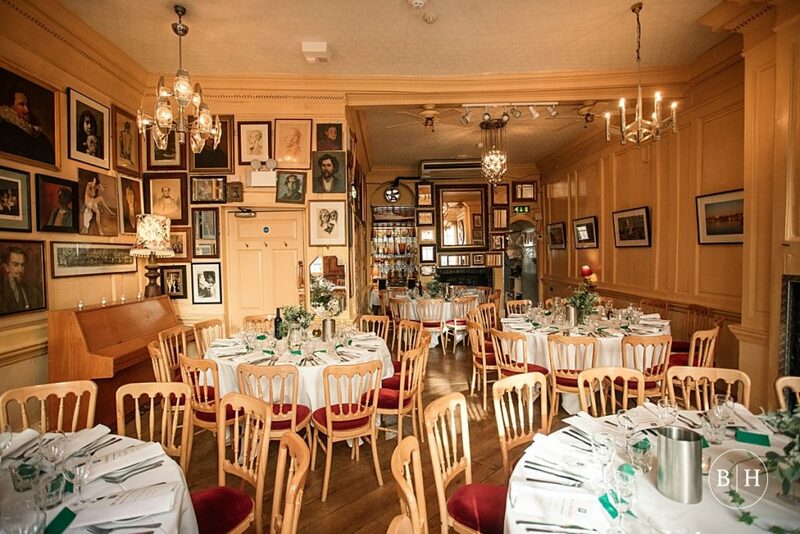 Its’ a gorgeous Georgian Townhouse, with an eclectic mix of frames and pictures on the wall of the dining room. 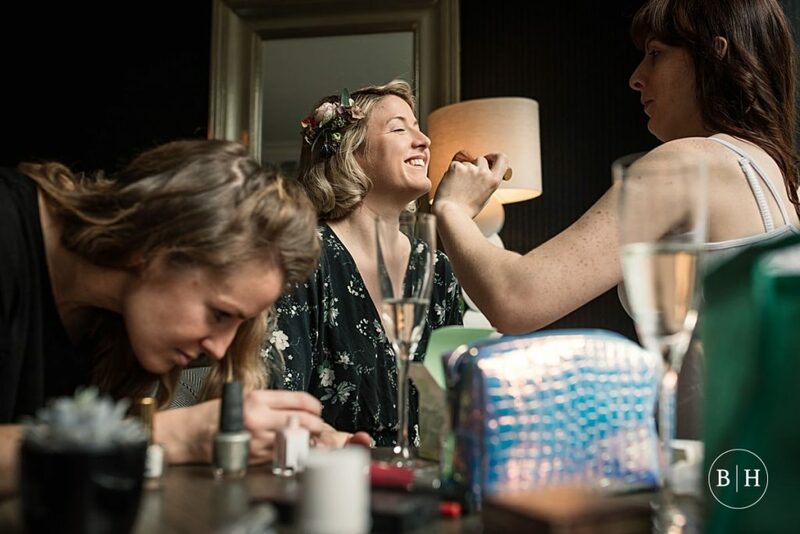 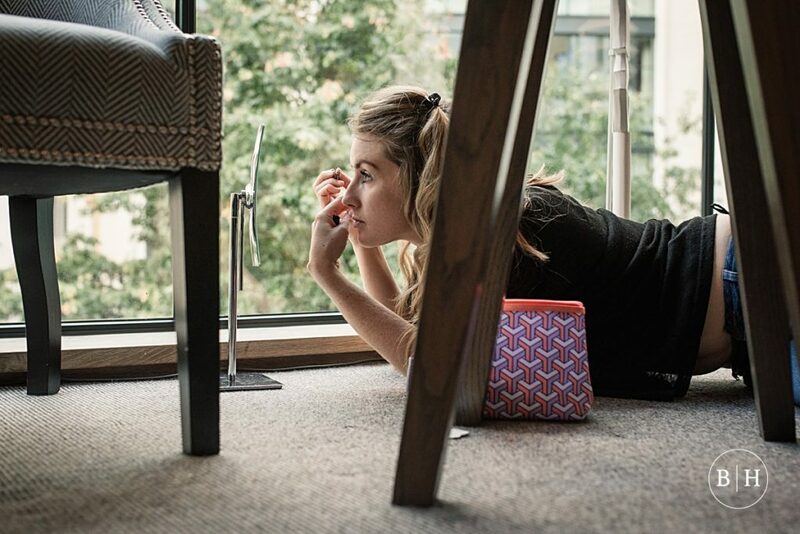 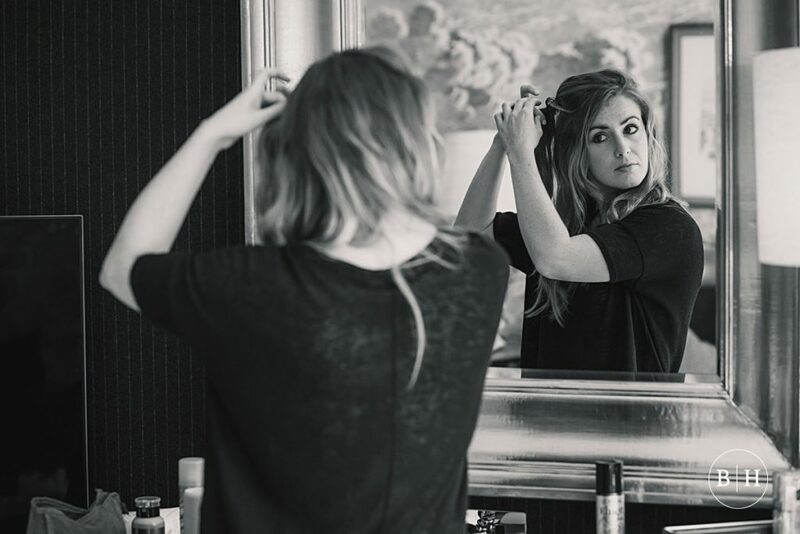 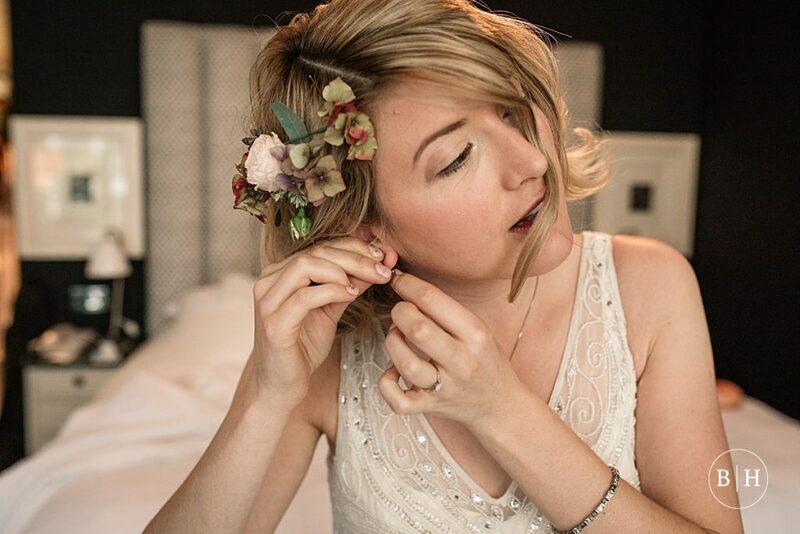 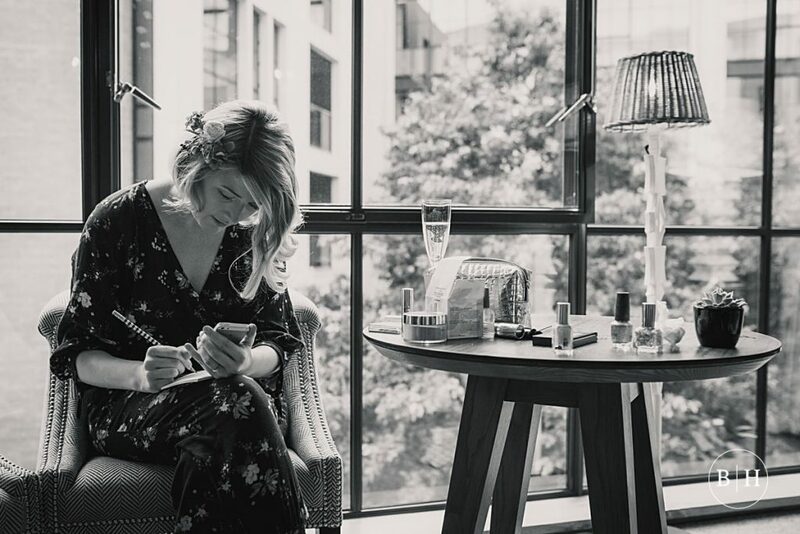 Chloe got ready at her usual salon where she had her hair done, and then finished getting ready at the amazing Ham Yard Hotel with her mum and bridesmaids. 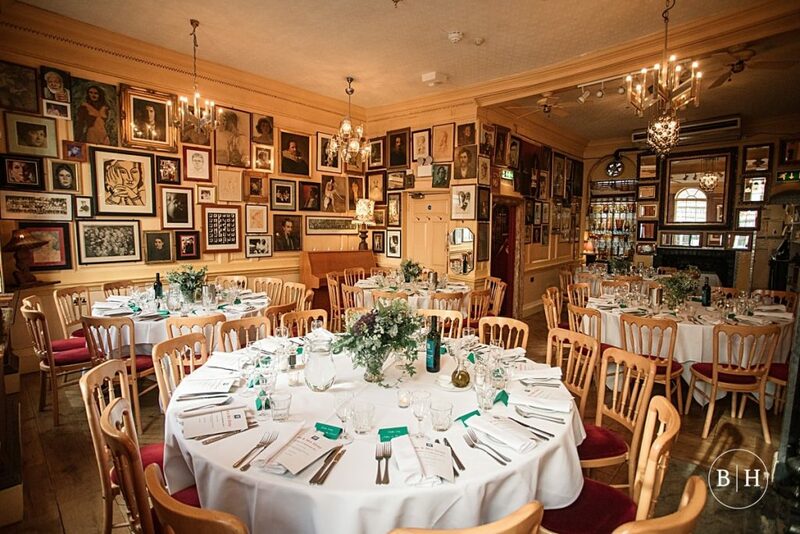 I love the Ham Yard Hotel, it’s another really quirky venue with gorgeous rooms. 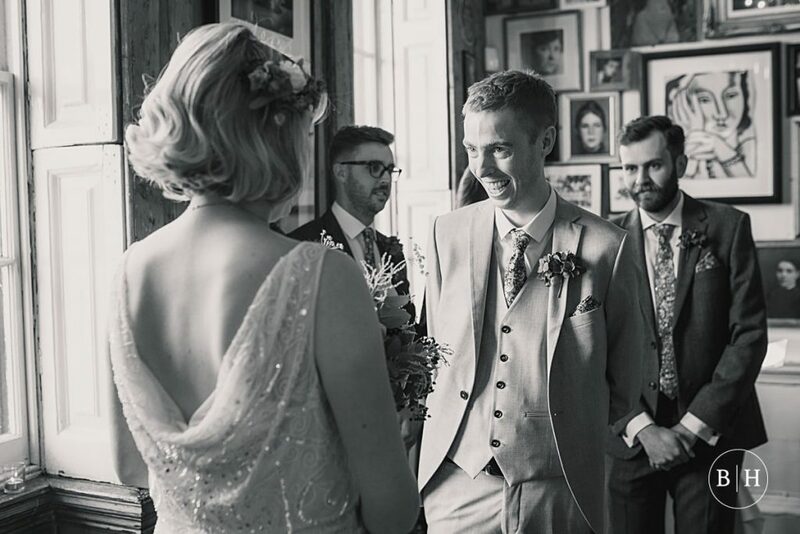 I particularly loved the wallpaper and portrait hanging in the room, which was great for photos of the bouquets! 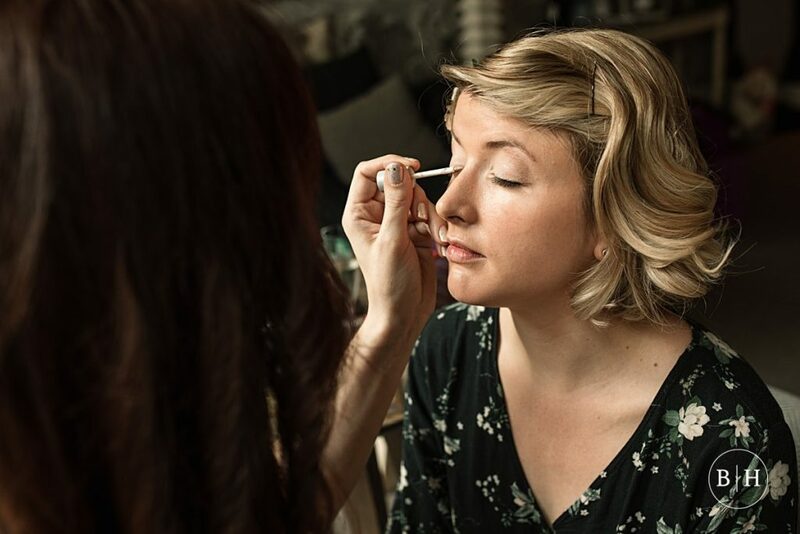 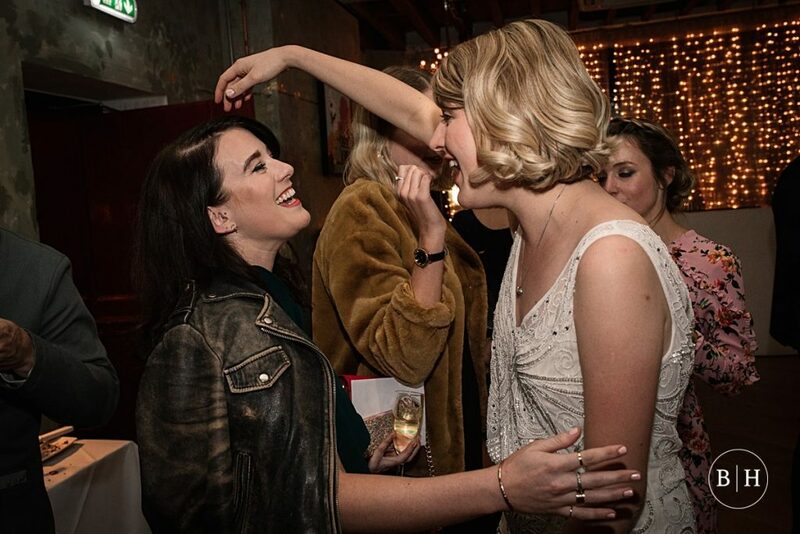 One of Chloe’s bridesmaids did her make up, and there was lots of champagne and giggles! 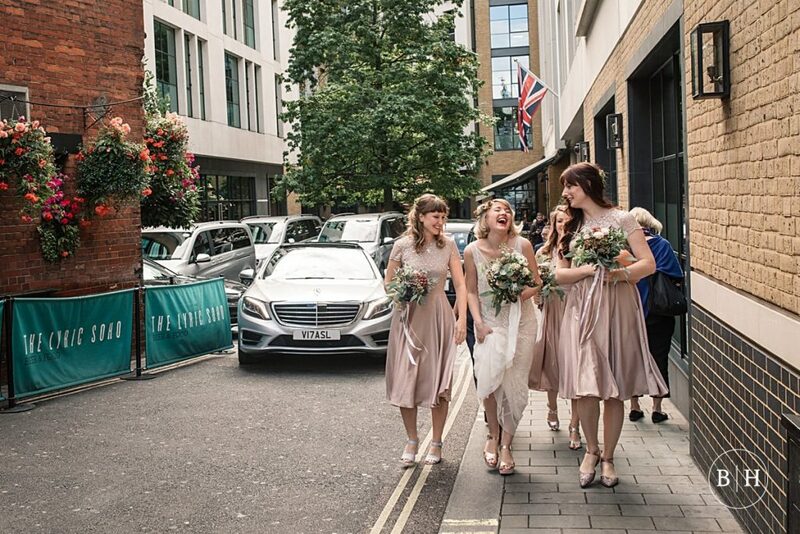 Once ready, the girls walked the short distance to the ceremony. 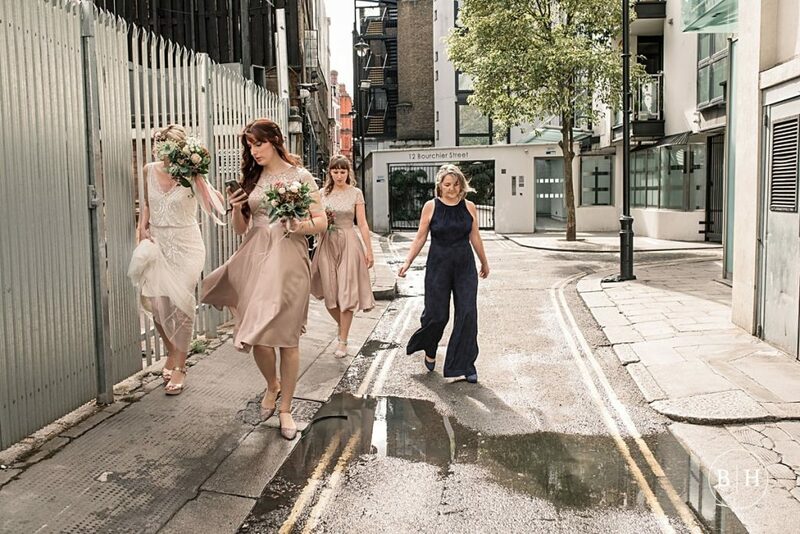 Some of my favourite shots from the day are of Chloe and her mum and bridesmaids strolling through the streets of Soho. 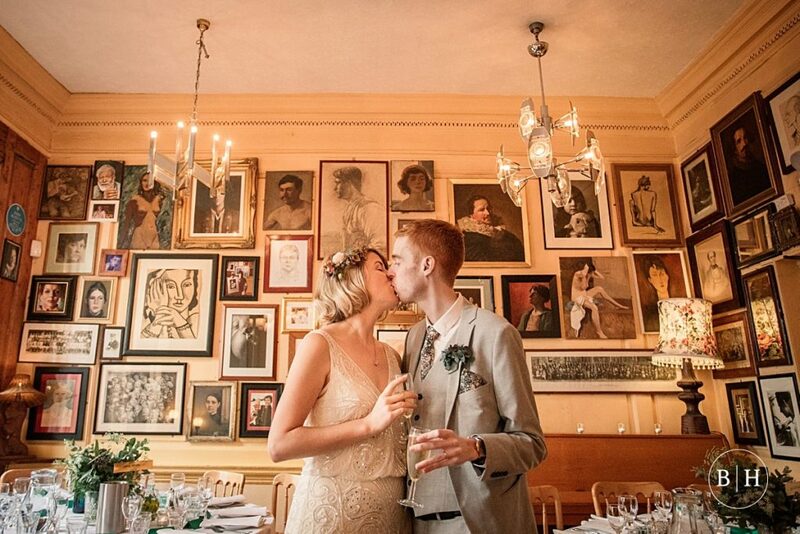 The wedding itself was an intimate affair in the quirky dining room at the Union Club. 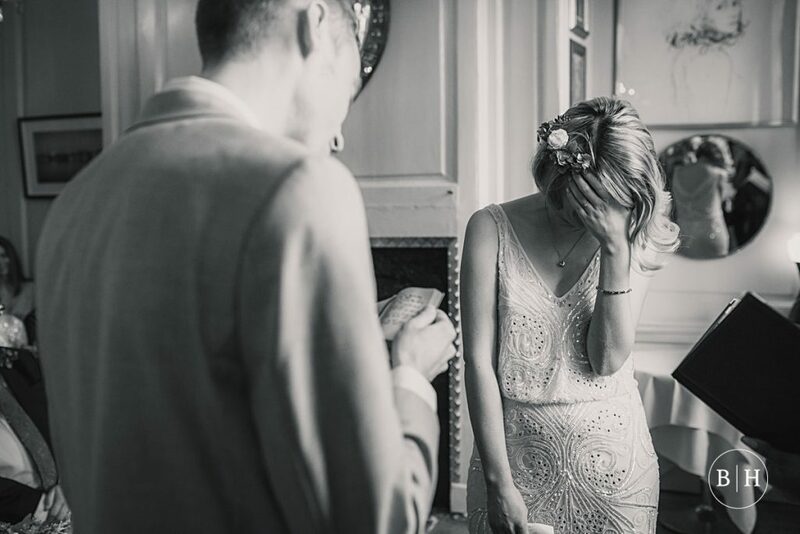 During the ceremony the couple read their own vows. 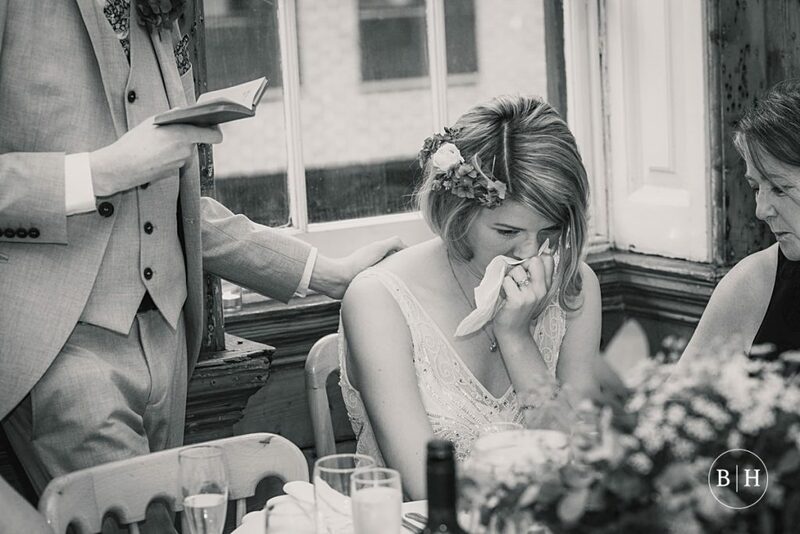 It was so emotional. 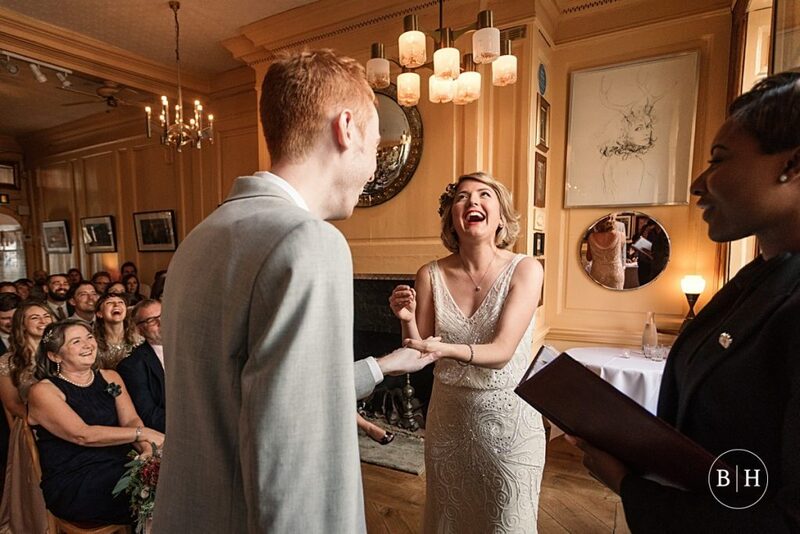 I think you can really tell just how excited Chloe is to be marrying Sam! 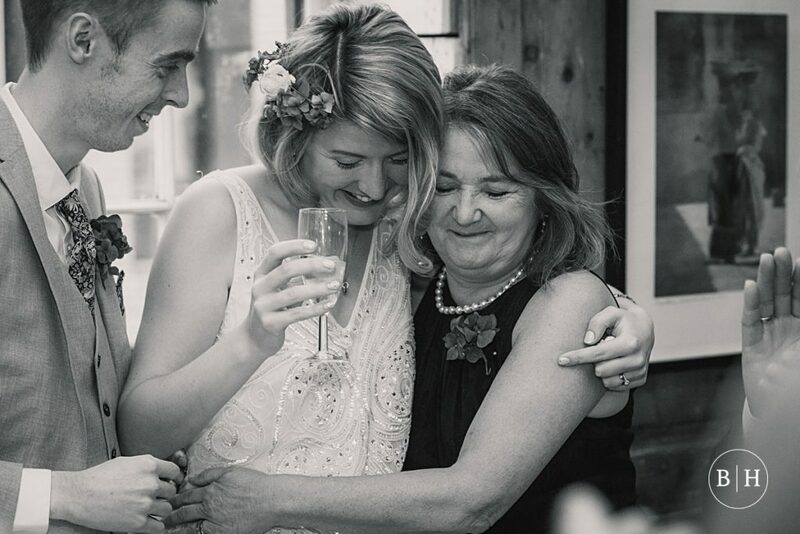 They also had readings from their close family, which was lovely too. 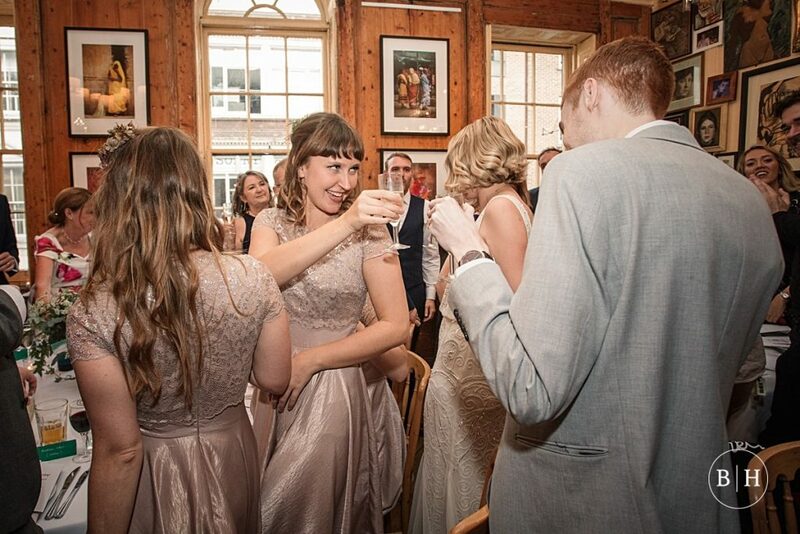 After a quick confetti throw and some quick group shots in Soho Square, the drinks reception was downstairs at the Union Club while the Dining room was turned around for the wedding breakfast. 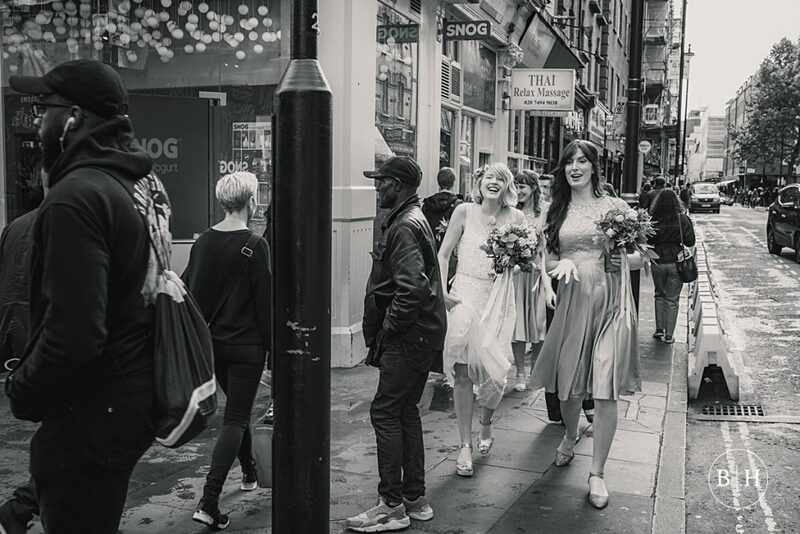 There was live music to entertain the guests whilst Sam, Chloe and I went for a walk around the streets of Soho and for some couples portraits. 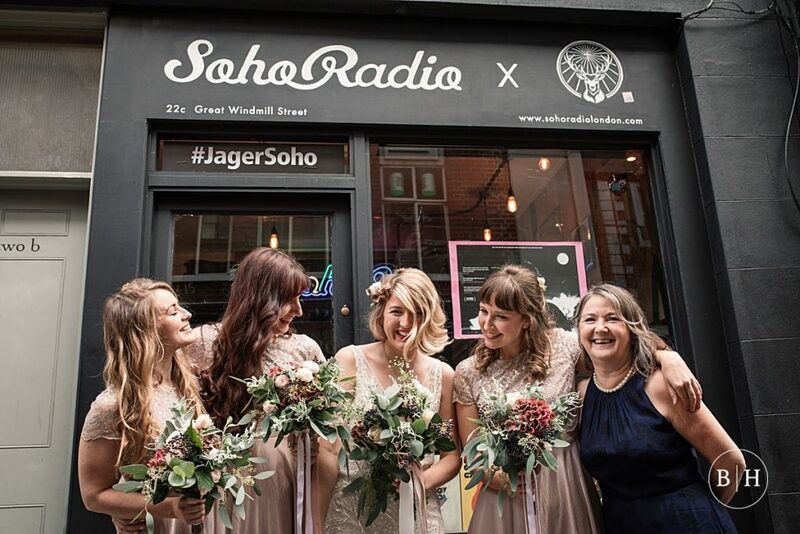 We of course stopped by Soho Radio, as that’s where the couple met, and Chloe and Sam stopped off for a quick pint on the way back! 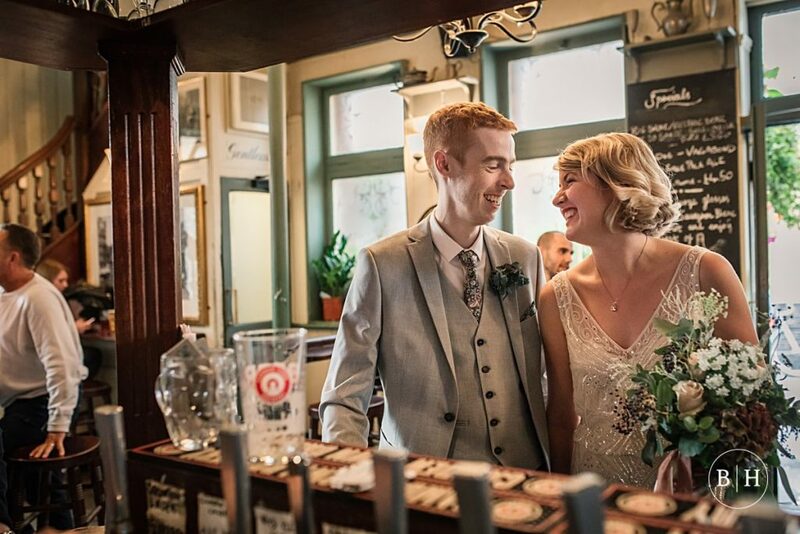 I loved how individual Chloe and Sam’s wedding was to the two of them – they did exactly what they wanted on the day and it really reflected their relationship from start to finish. 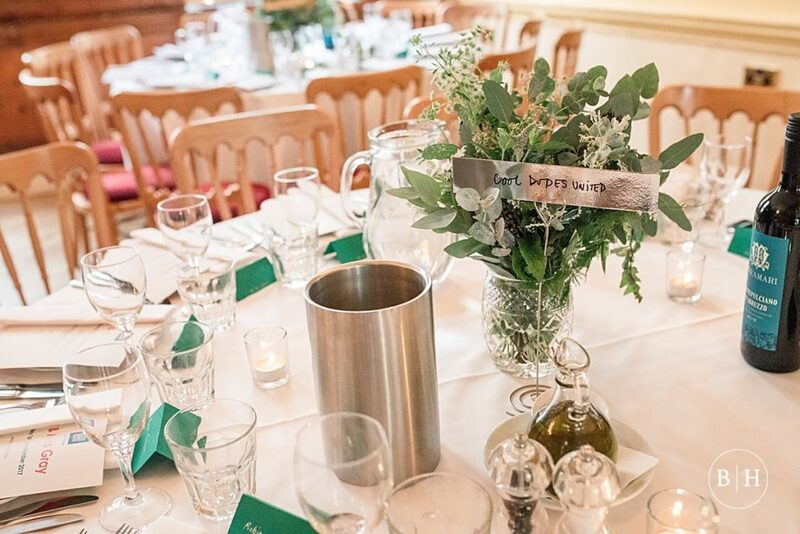 The venue didn’t need all that much decoration, as it’s crammed full or quirky touches already! 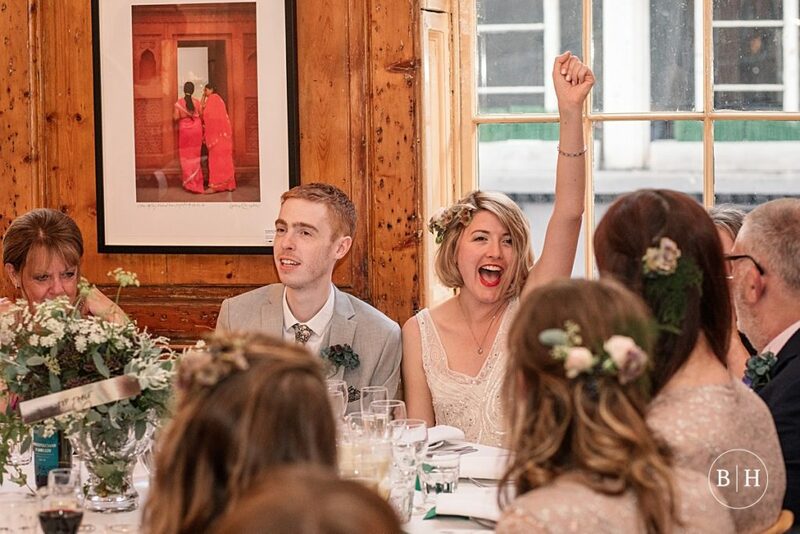 I loved the table names the couple chose though – including ‘Planet Legend’ and ‘Cool Dudes United’! 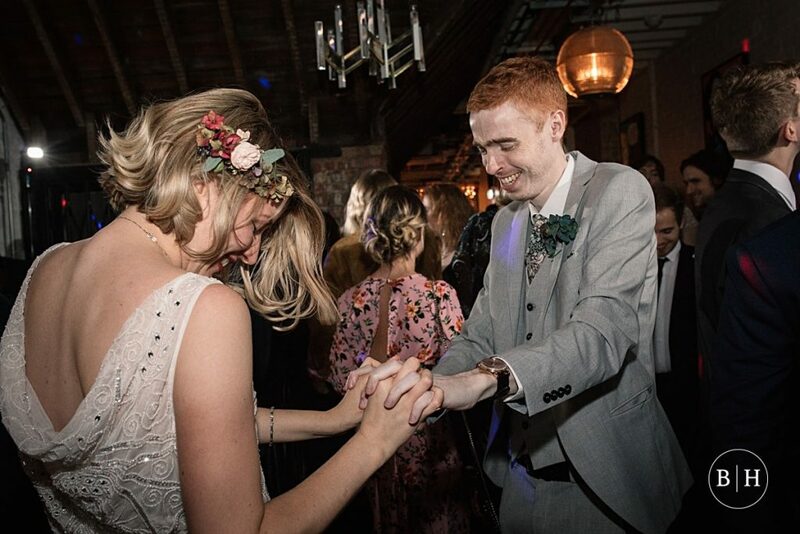 In the evening, the first dance was to Hot Chip, and they finished off the evening with all their mates from Soho Radio doing their own DJ sets. 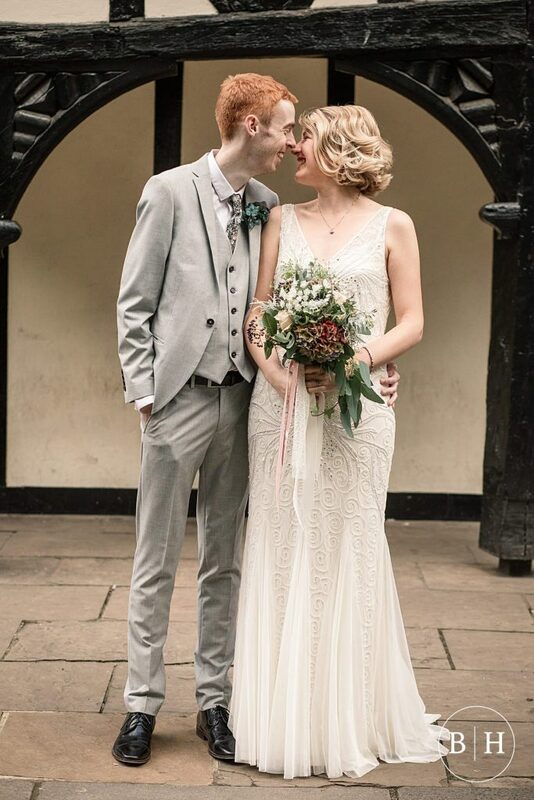 Chloe wore a gorgeous embellished dress from Phase Eight and Sam wore a grey suit from Asos. 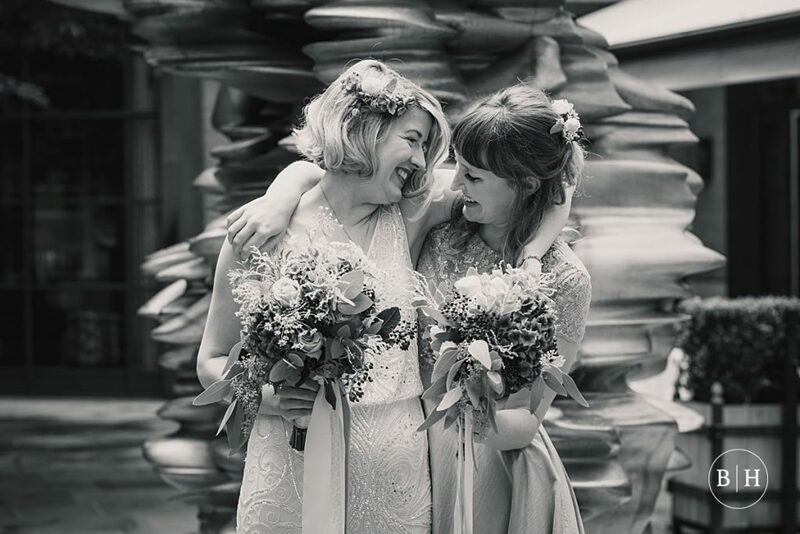 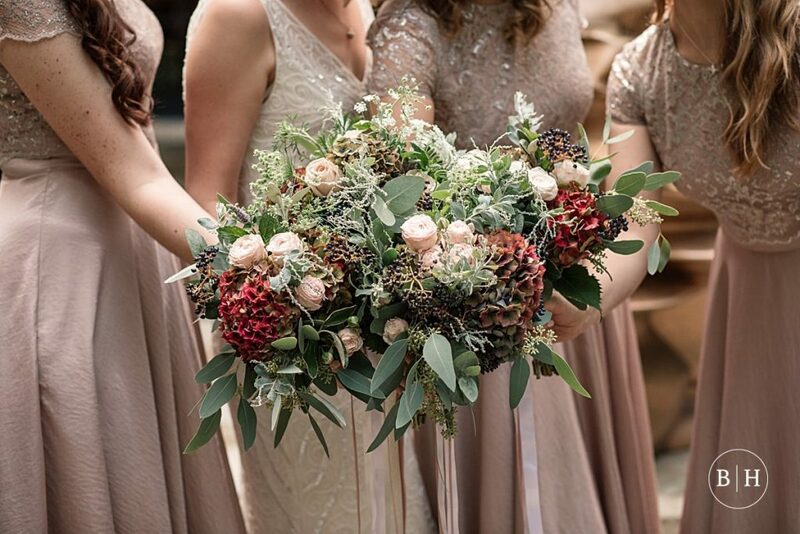 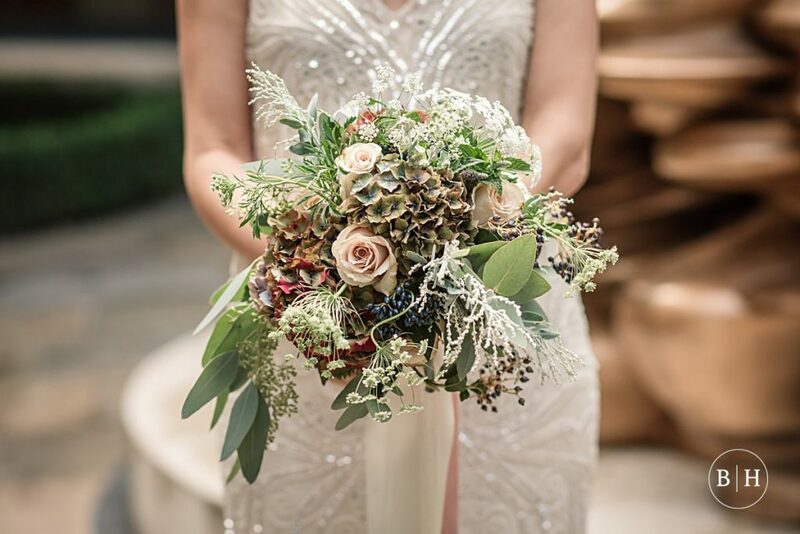 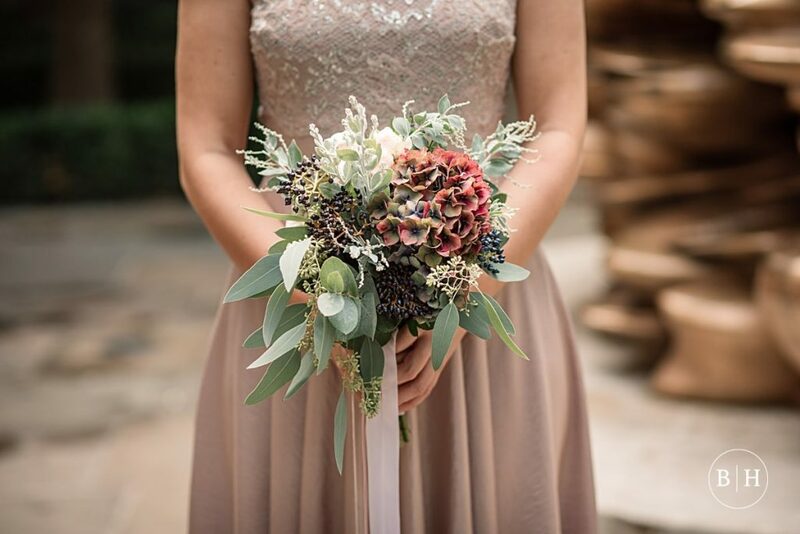 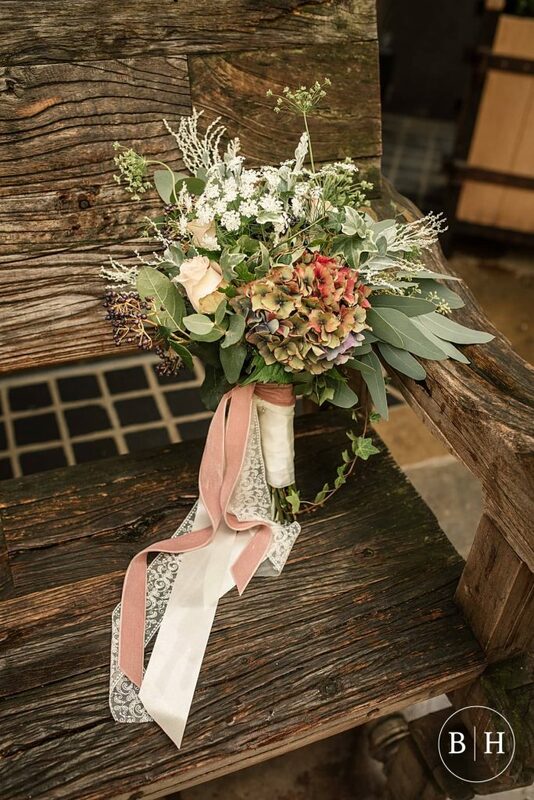 Chloe’s flowers were absolutely stunning – a wild bouquet from Wild at Heart, and Chloe also had real flowers in her hair. 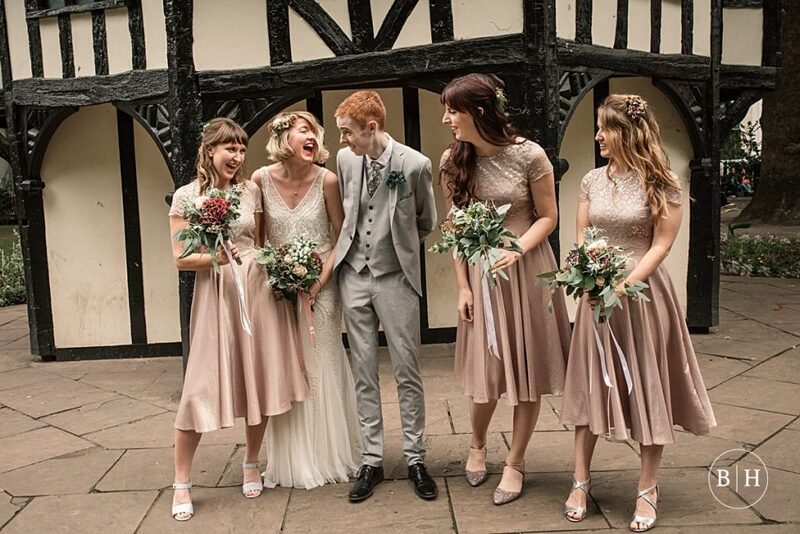 The bridesmaids were in dresses from Asos and looked amazing. 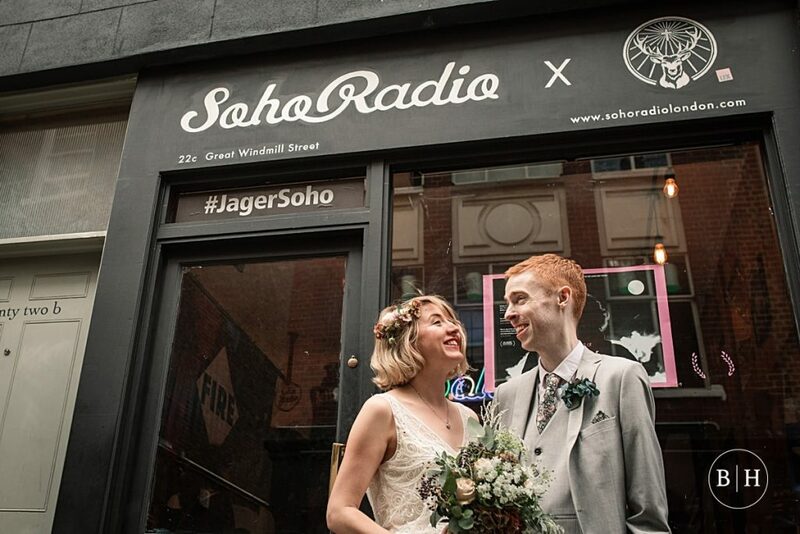 Chloe and Sam met at Soho Radio station where they both volunteer and have been together for several years. 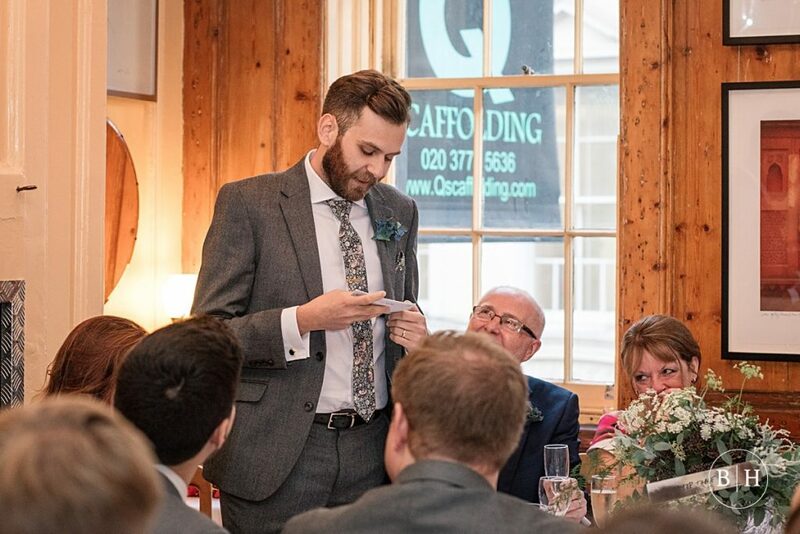 They got in touch with me based on a recommendation at the beginning of the year, and their enquiry really stood out as I’d worked at Soho Union Club before so I knew how awesome the venue was. 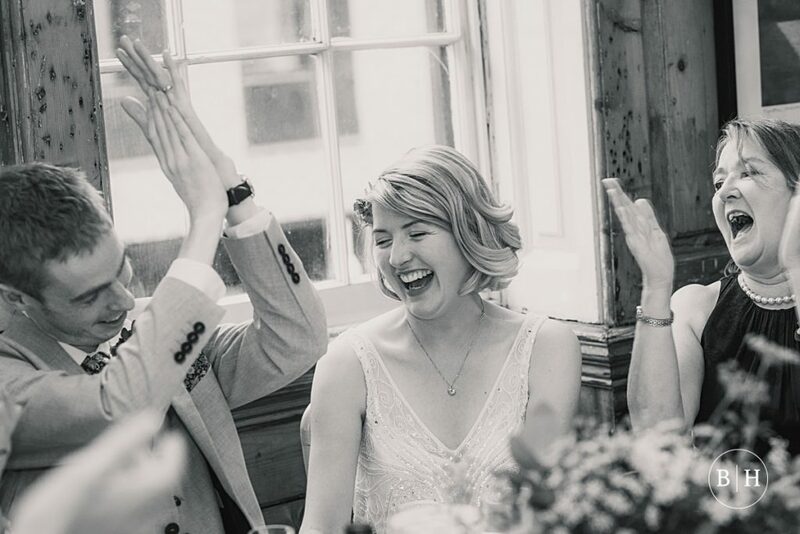 They said they didn’t like having their photos taken, so they wanted someone who would just be there to capture the action as it unfolded, and I loved that they seemed so much fun. 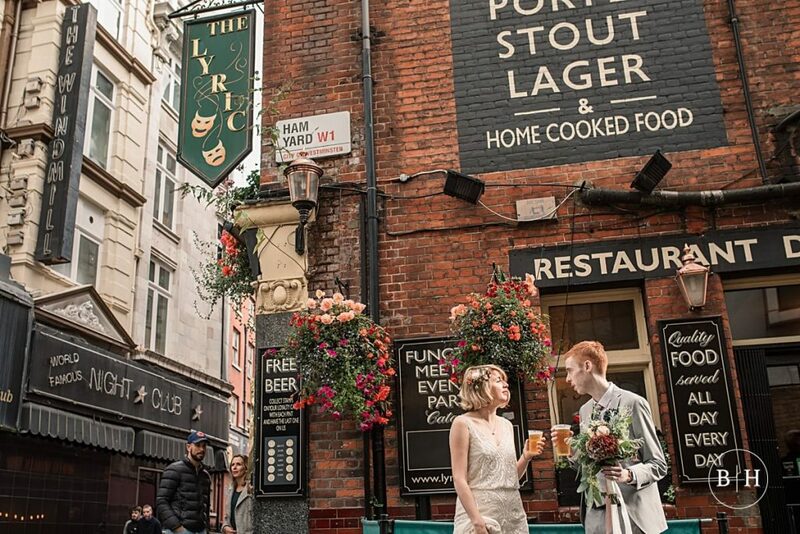 The couple says that if you’re planning your wedding, the biggest piece of advice they could give you is to drink in the atmosphere. 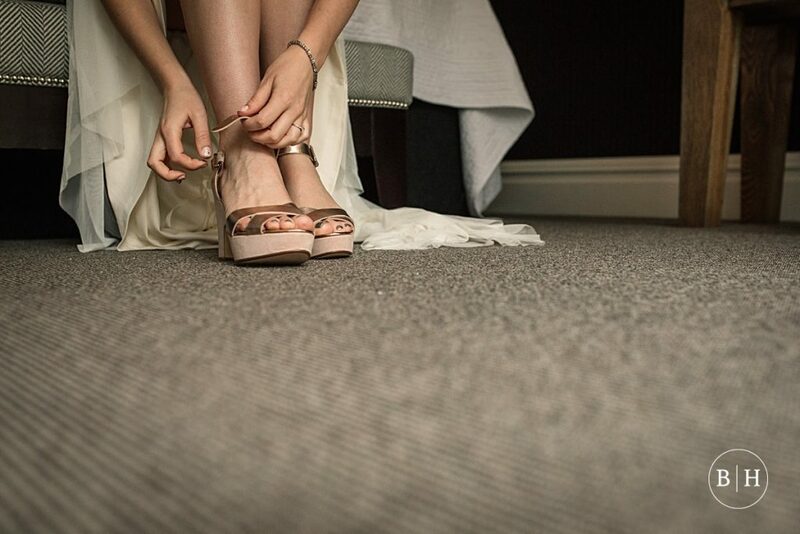 Its all over before you know it! 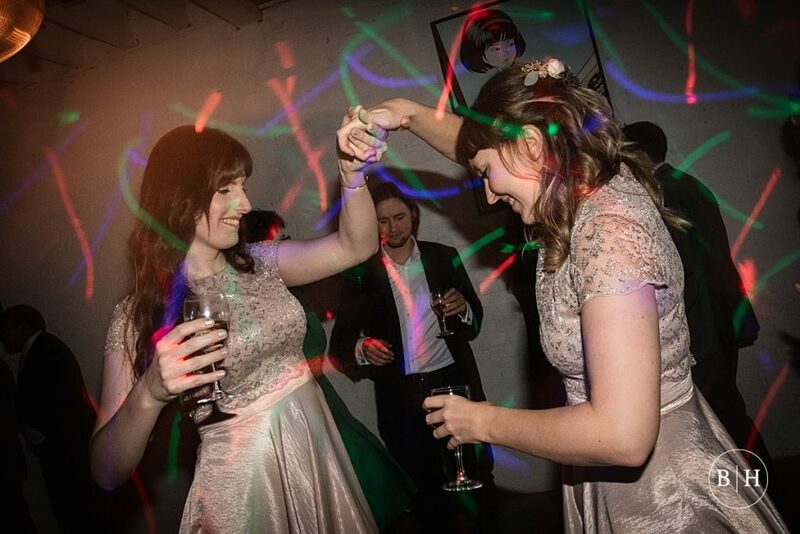 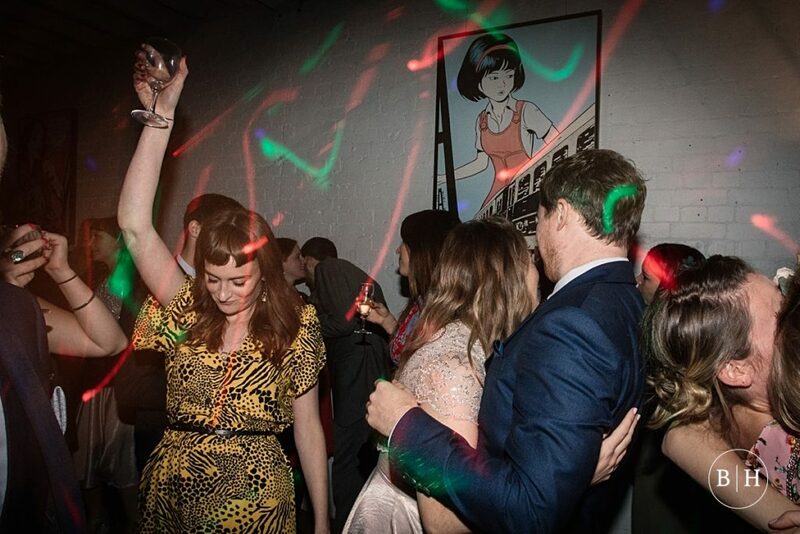 Chloe and Sam’s wedding was totally epic and so much fun. 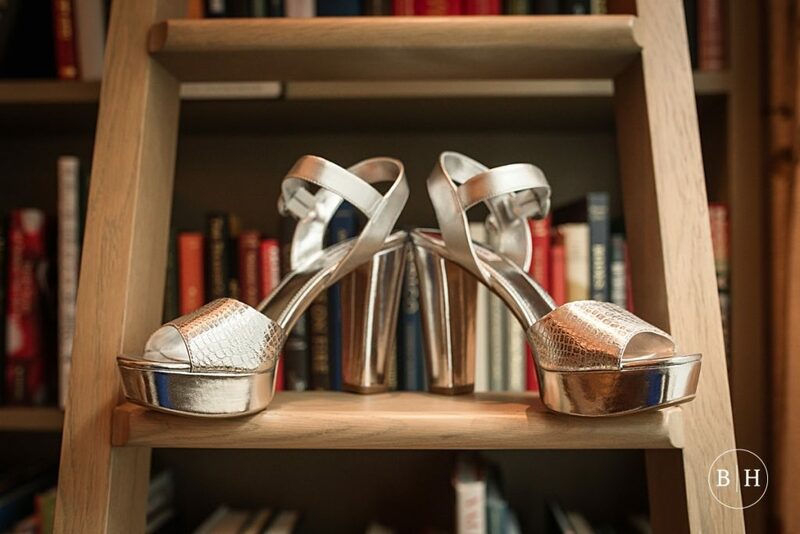 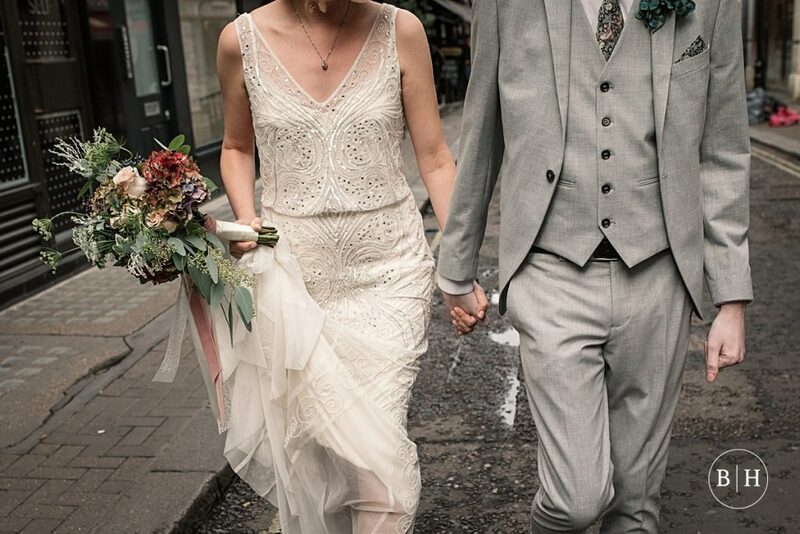 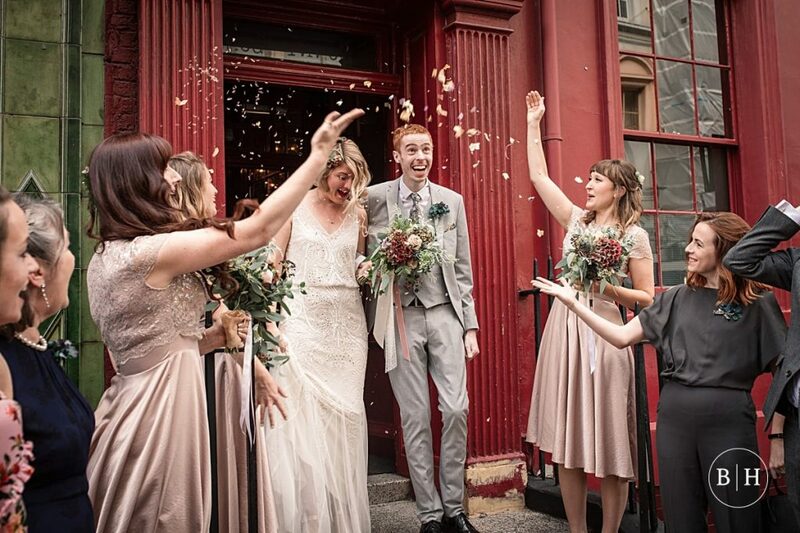 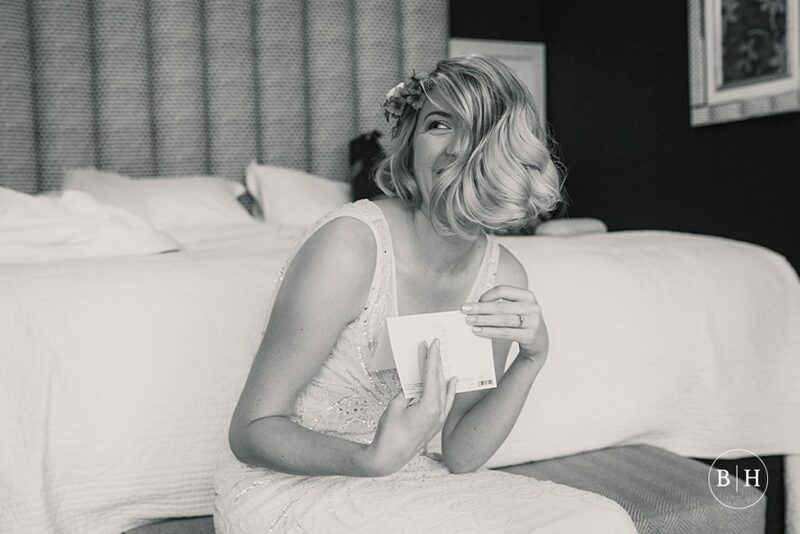 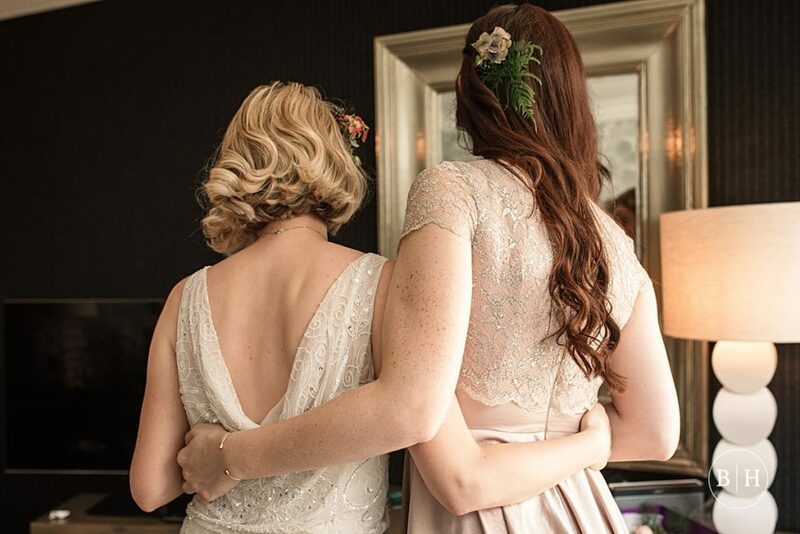 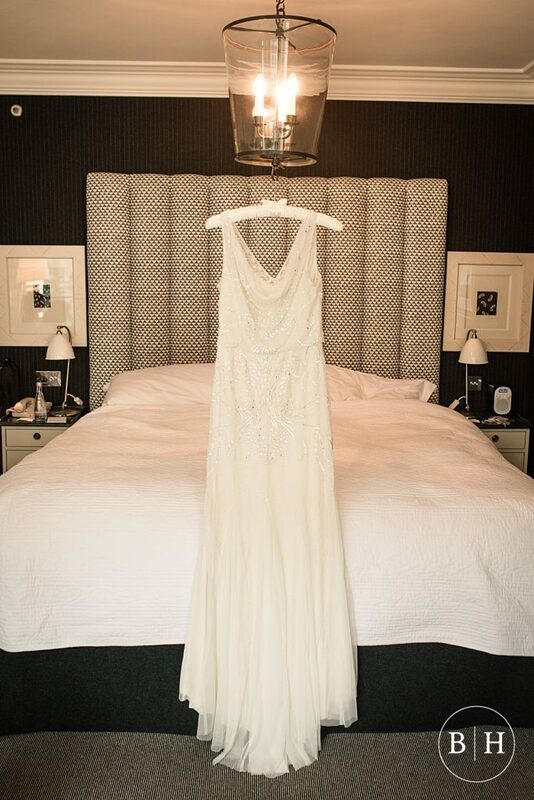 Here’s their Soho Union Club wedding for you to enjoy! 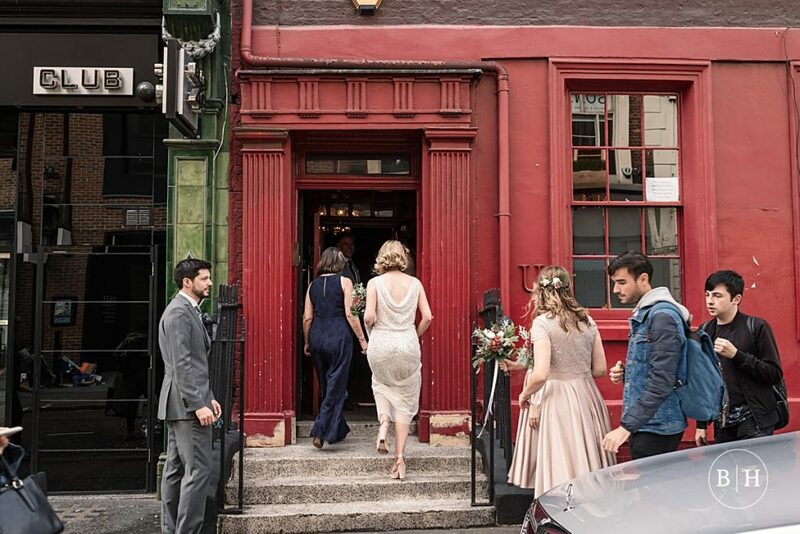 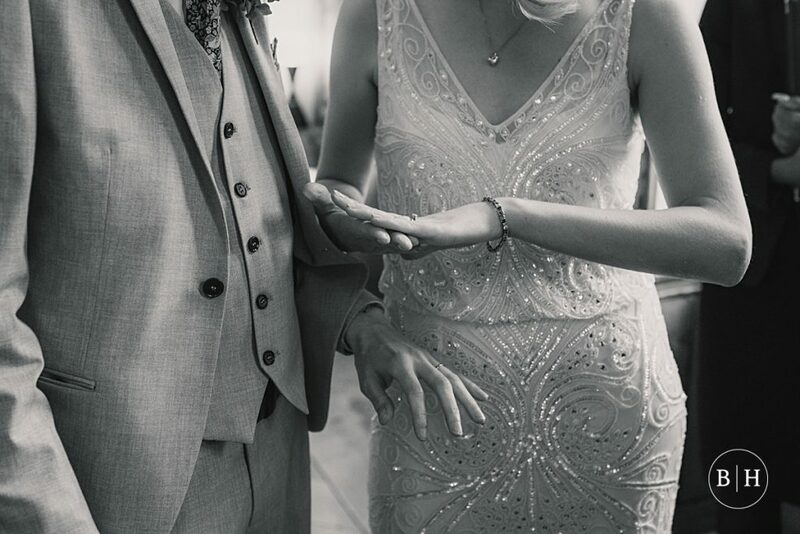 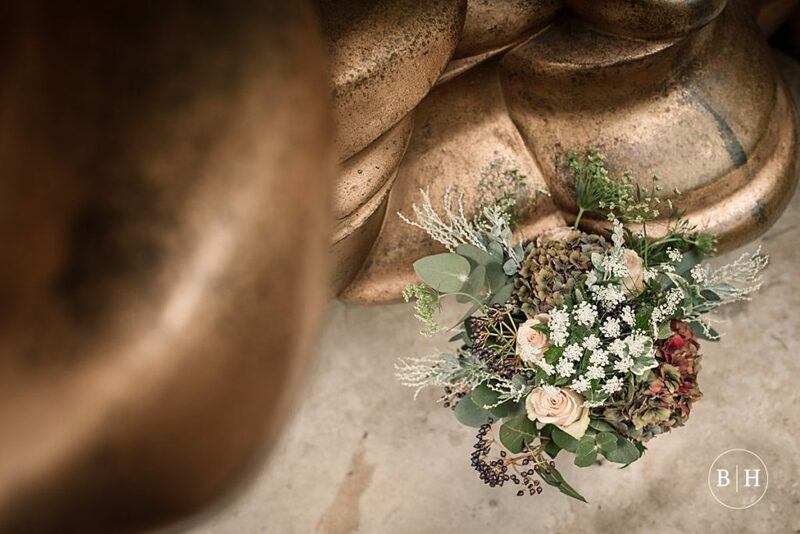 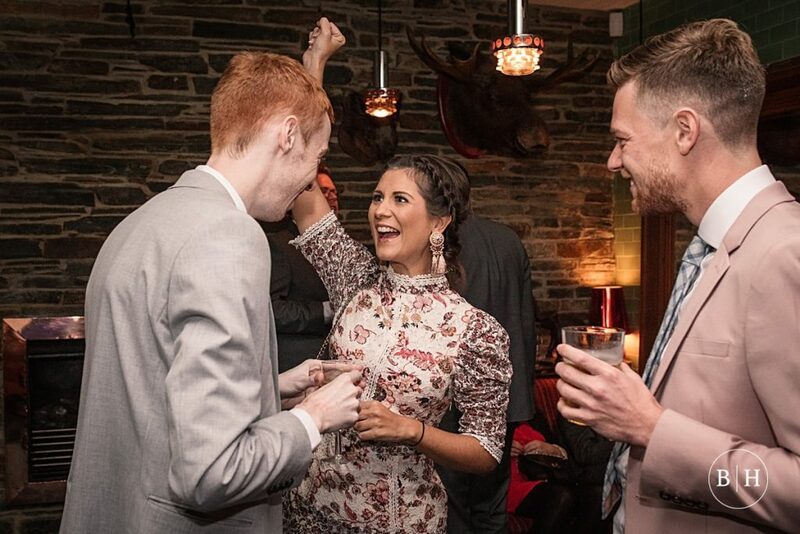 If you’re planning a Soho Union Club wedding, please do get in touch – I would love to hear all about your plans! 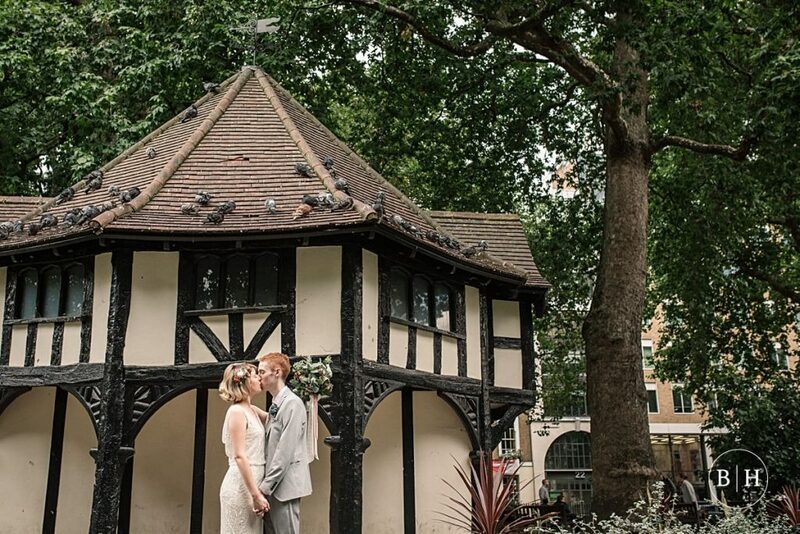 What a lovely venue, and the photos are so nice and natural. 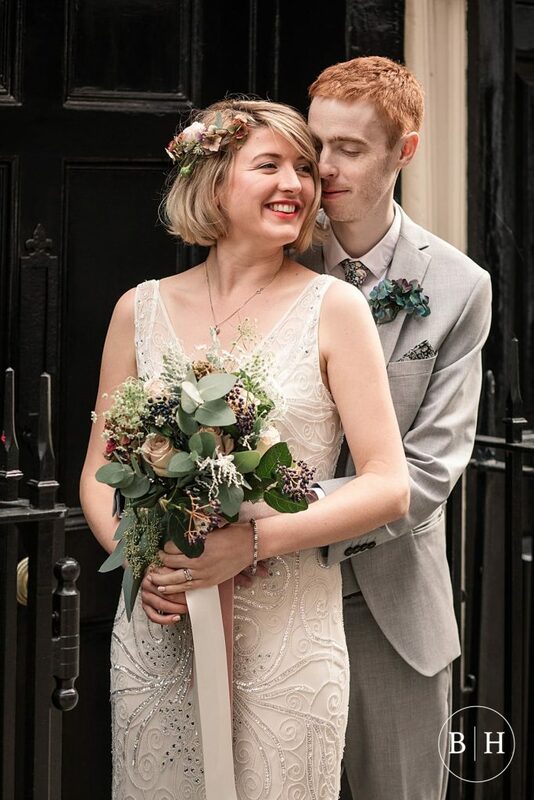 Looks like they had a fantastic day. 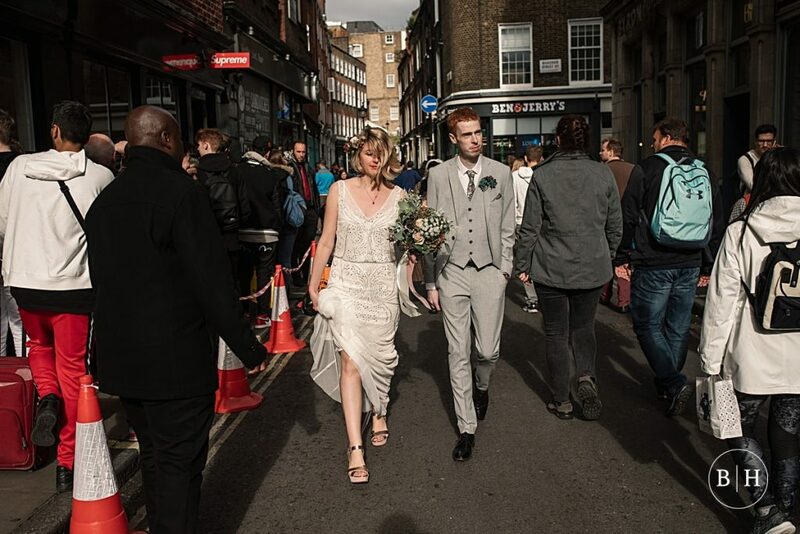 Love a walk through the streets with the bride and groom. 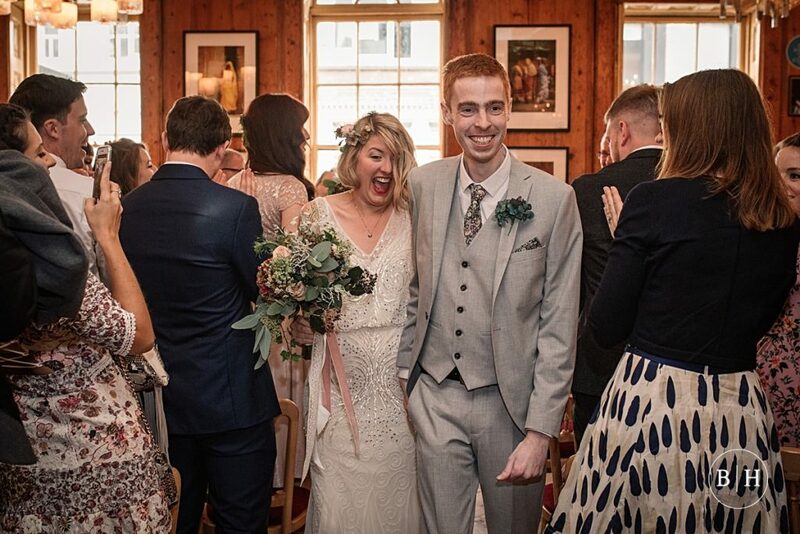 So many happy photos Becky – looks great! 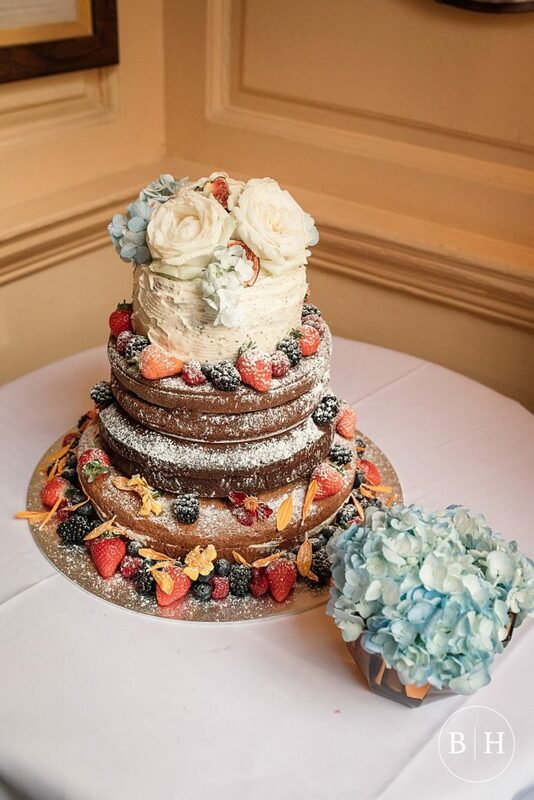 Beautiful work Becky. 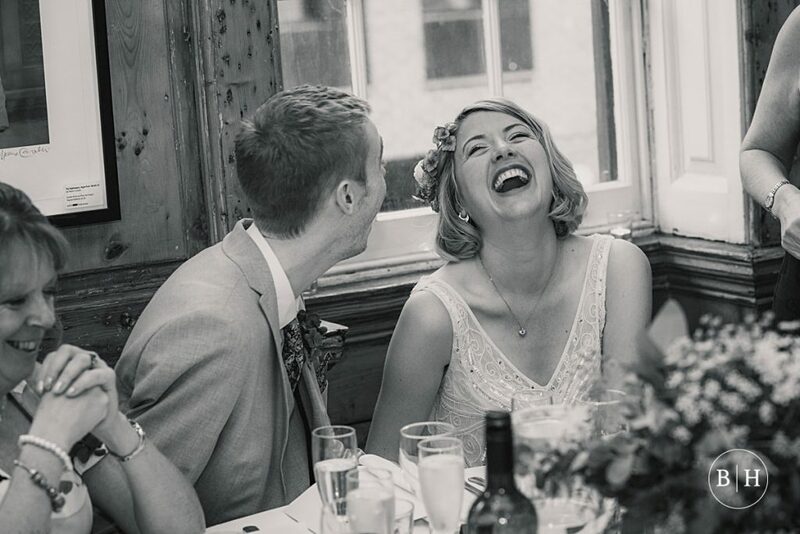 The style of your imagery is lovely, you’ve captured the atmosphere and emotion perfectly. 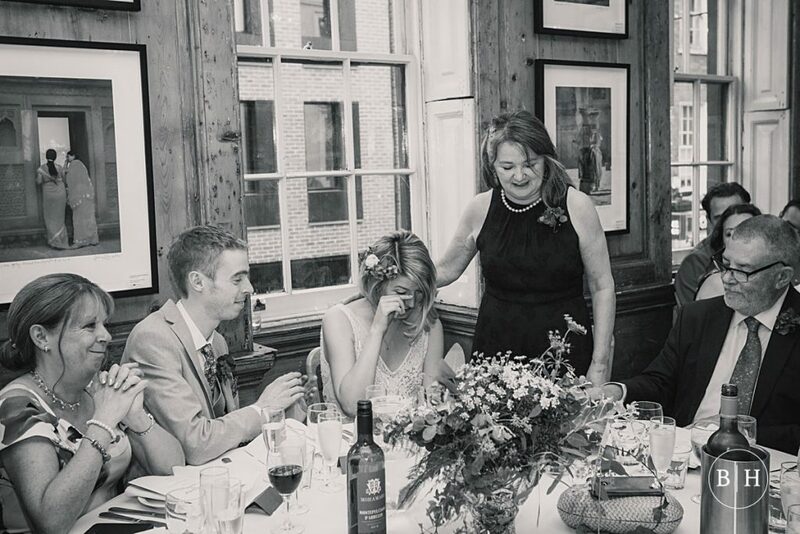 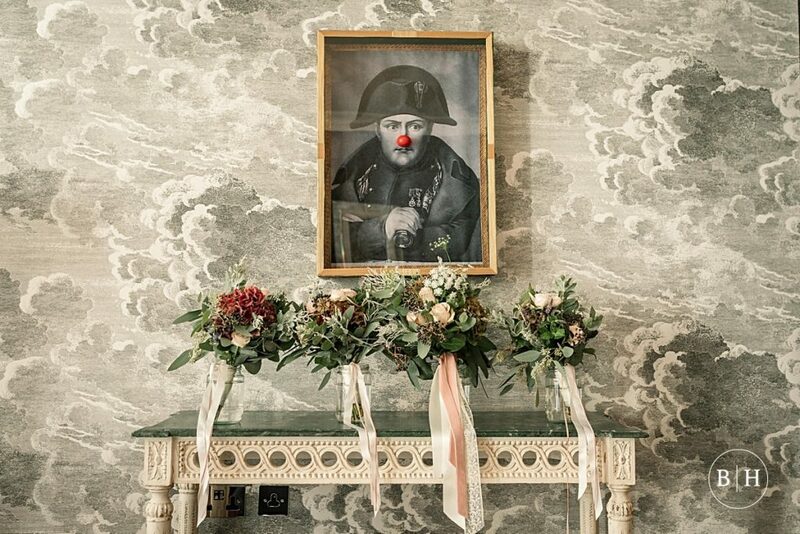 Especially like the picture of the bouquet’s with the picture on the wall, it made me giggle! 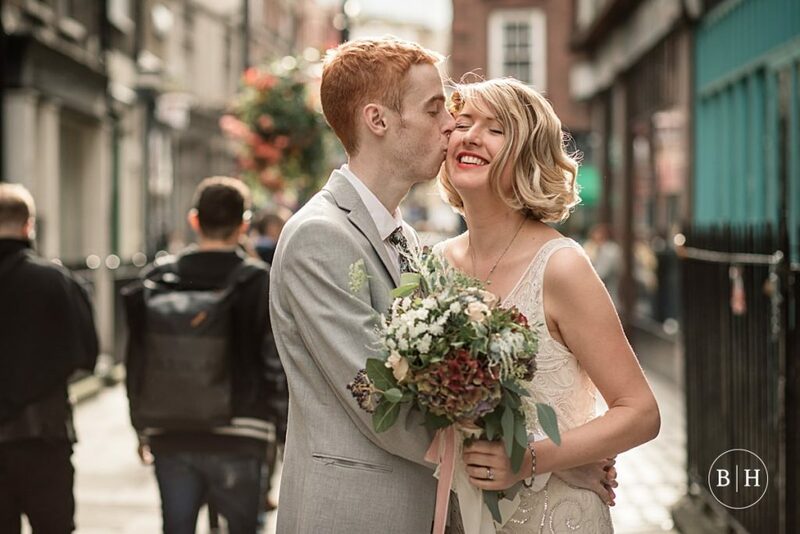 Lovely tones and images here Becky! 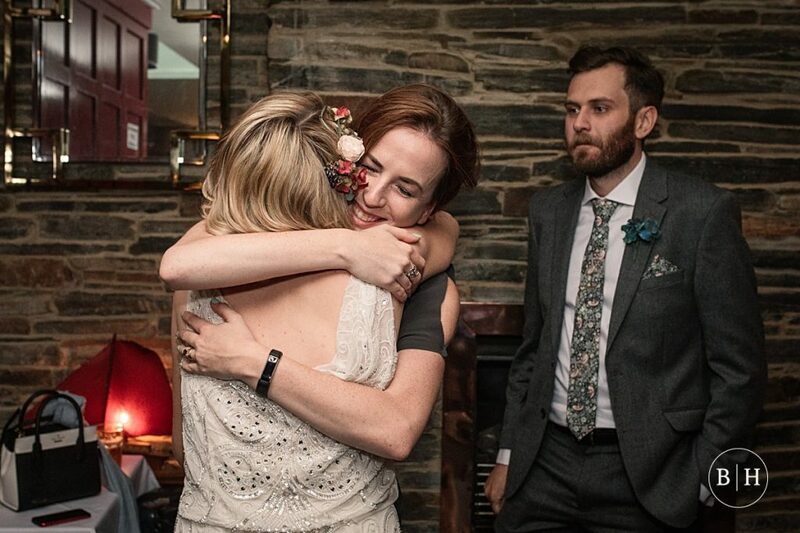 So many special moments Becky. 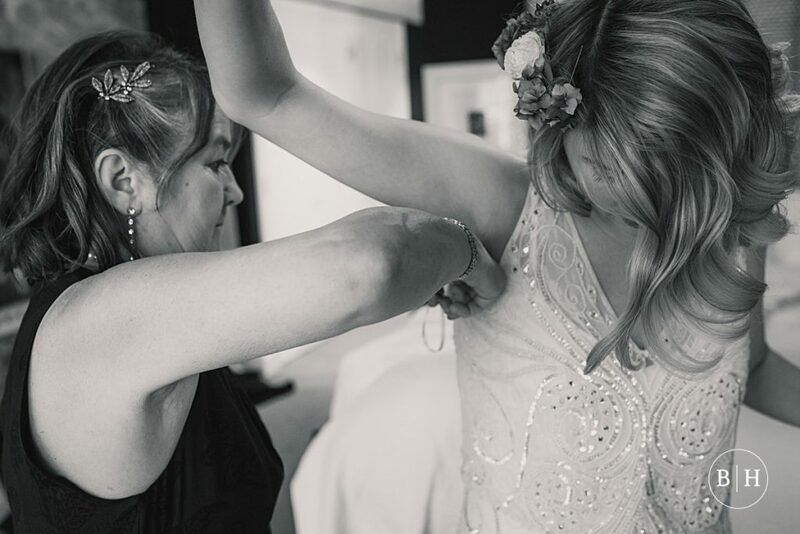 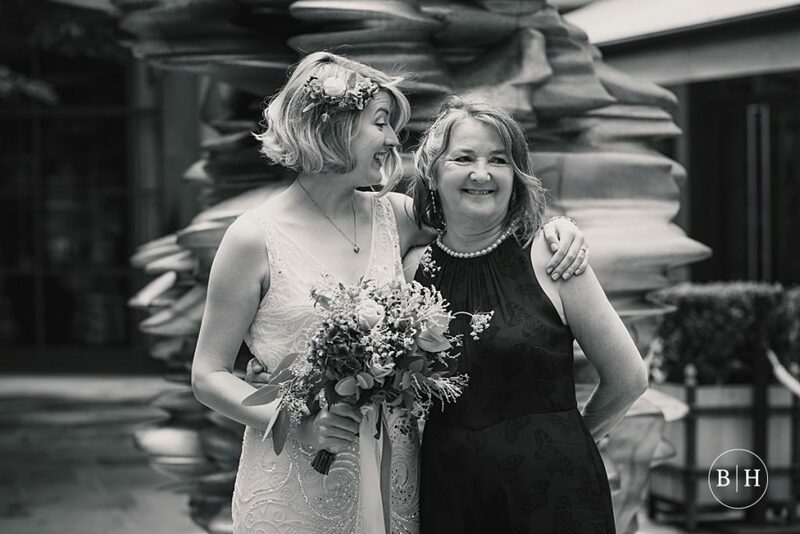 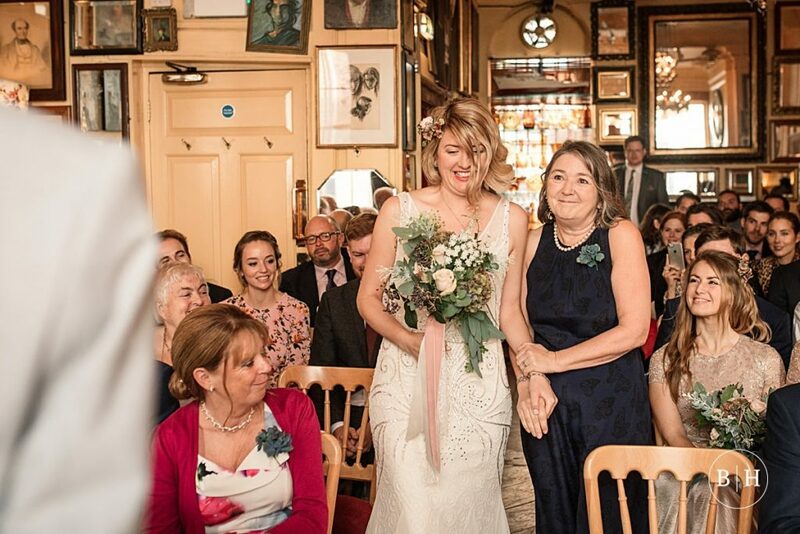 The Bride looks like she’s having the time of her life, and has such a special bond with her mum! 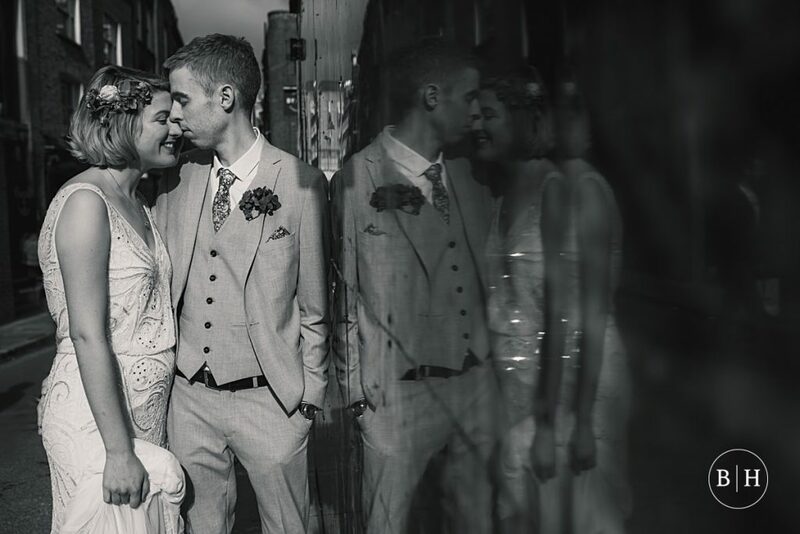 Great work Becky, Just love the tones in the colour edit, very unique. 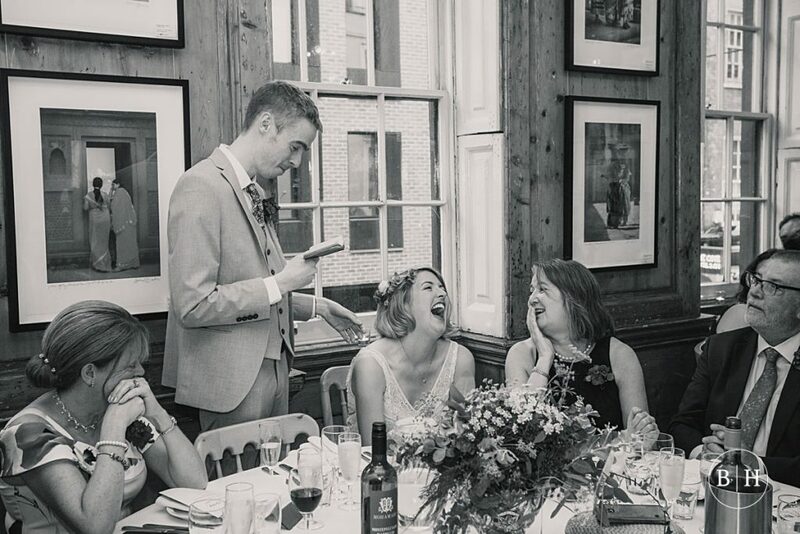 Great story telling as well!